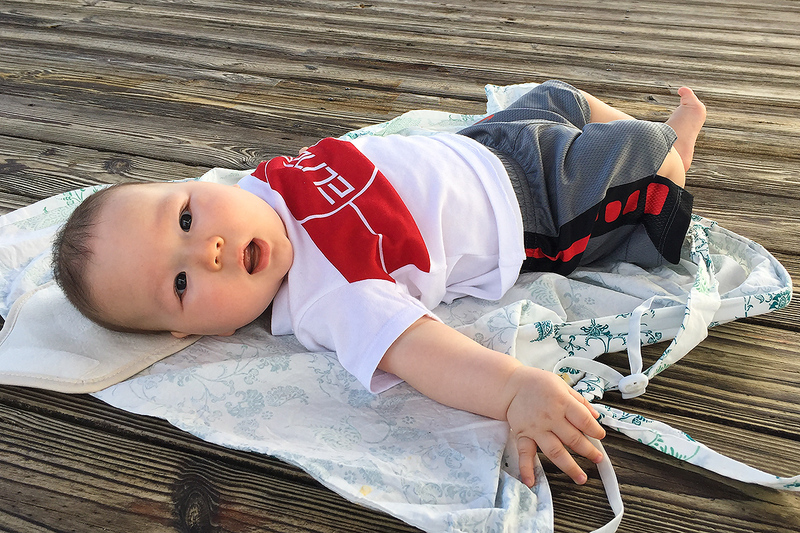 The birth of my son ended my birding career in China and catapulted me back to the United States. 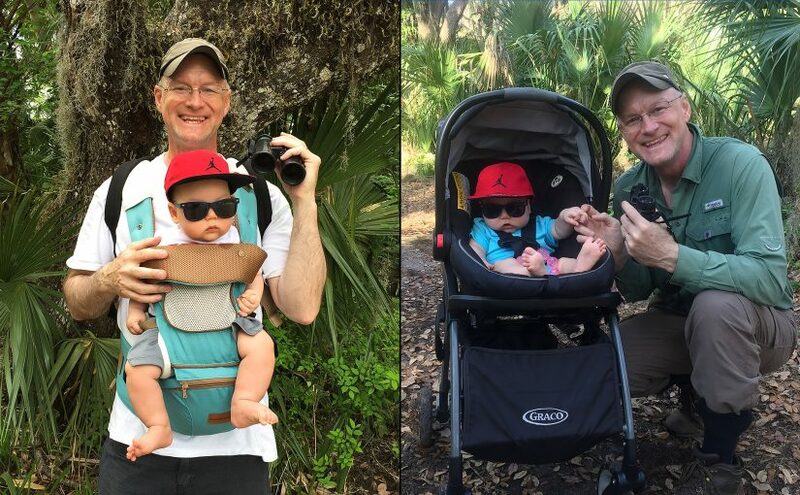 I returned to Florida on 31 Jan. 2018 and accepted my new status of Birder While Daddy. Here’s how I have adjusted. Despite the daily dose of joy my son brings, my addiction to birding remains. Fortunately for me, in Florida, getting one’s birding fix is easy. 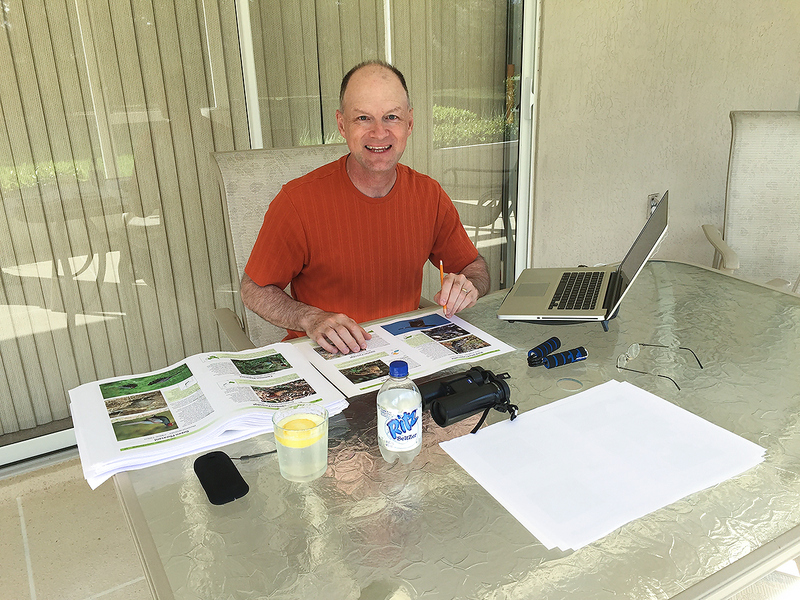 On Fri. 2 March, for example, I was on my back porch, proofreading for Bloomsbury a draft of a field guide. A feeding party of woodland birds arrived in the back yard. I stepped into a wave of wood warblers (Northern Parula, Black-and-white Warbler, Yellow-throated Warbler) vireos (Blue-headed Vireo, White-eyed Vireo), and woodpeckers (Downy Woodpecker, Yellow-bellied Sapsucker). A diminutive Common Ground Dove was associating with the wave, as was a Ruby-crowned Kinglet, cousin of Eurasia’s Goldcrest. 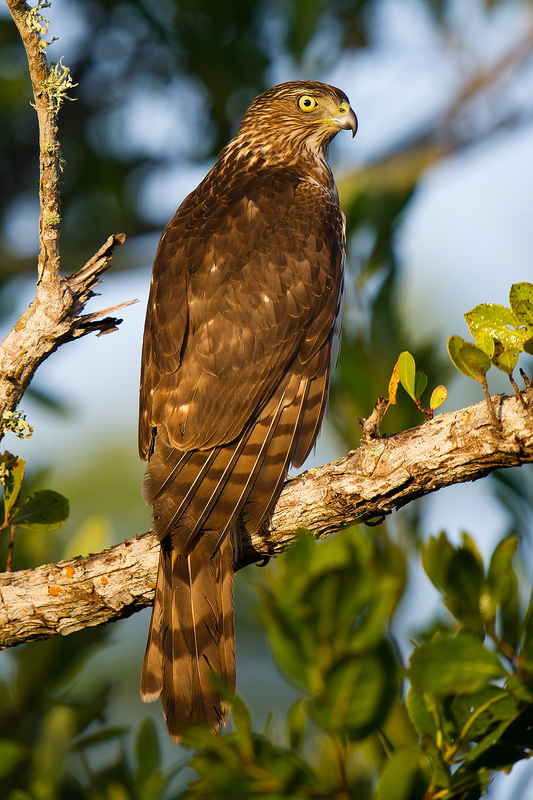 A House Wren emerged briefly from the bushes; Snakebirds, also known as Anhinga, were soaring high above; and U.S. endemic Fish Crow was making its low-pitched caw. My birding fix satisfied, I returned joyfully to work. 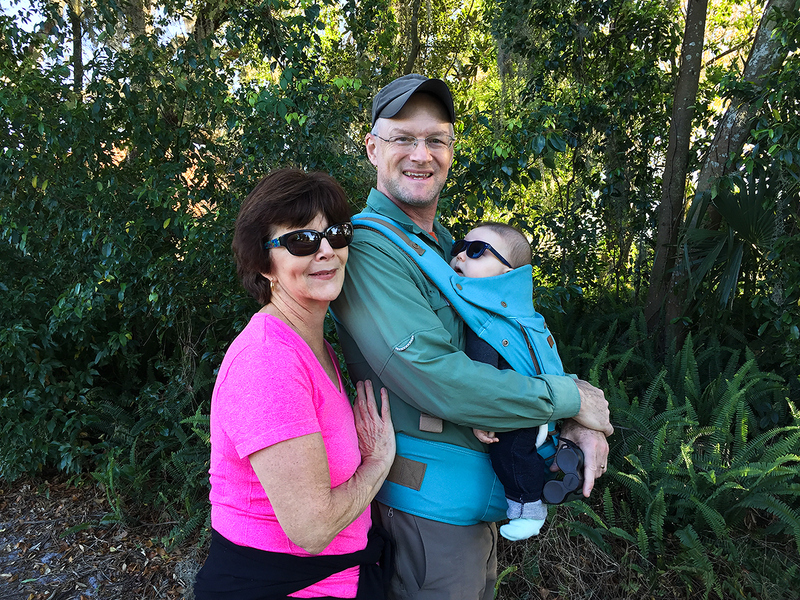 Walking with Elaine and Tiny along the suburban streets of Volusia County, I regularly find interesting species such as Sandhill Crane and Florida Scrub Jay, the latter the only species of bird endemic to the state of Florida. Nature reserves are plentiful in central Florida, and at one of the best, Lake Woodruff National Wildlife Refuge, Tiny recently added Bald Eagle to his infancy bird list. Always I am looking for little snatches of time in which to bird. My local patch is Gemini Springs Park, where last month I noted Painted Bunting as well as overwintering skulkers Ovenbird and Hermit Thrush. I recently ticked Wood Duck, American analogue to Mandarin Duck. I currently am not taking bird photos. 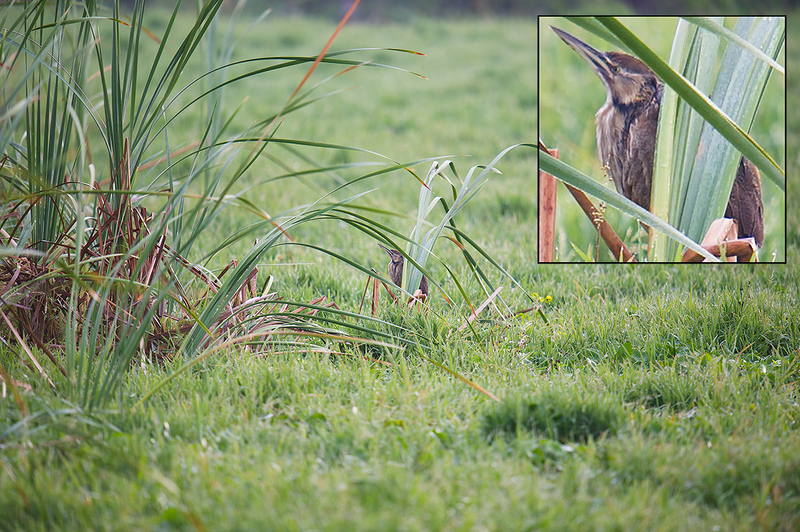 With a four-month-old in the house, photography adds to birding a layer of complexity that I must shed. I carry a sound-recorder, and my ears are always open. Recent strolls with Tiny have led to a heard-only tick of Barn Owl and a mysterious night-time flyover of Black-bellied Whistling Duck. On Monday I start a new career with RedChip, a company owned by my best friend from college and a leader in financial media and investor relations. 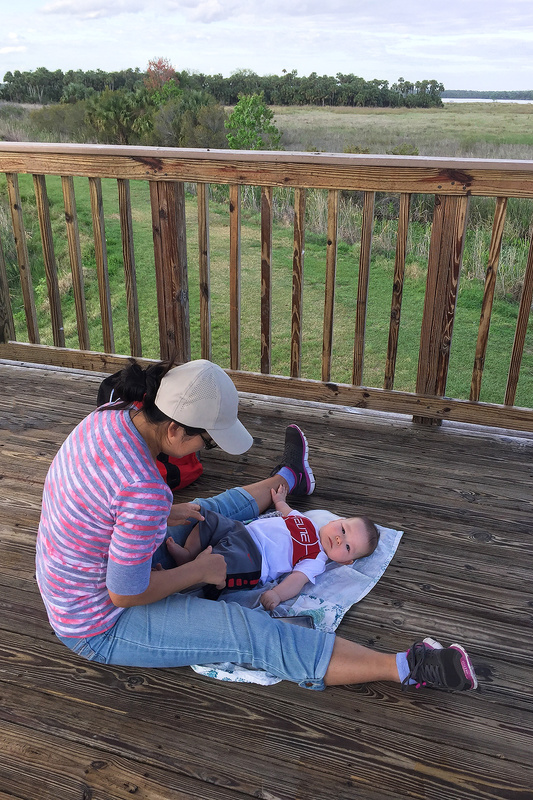 I’ll be birding less, but getting out as much as I can, as I continue to take on my new role of Birder While Daddy. 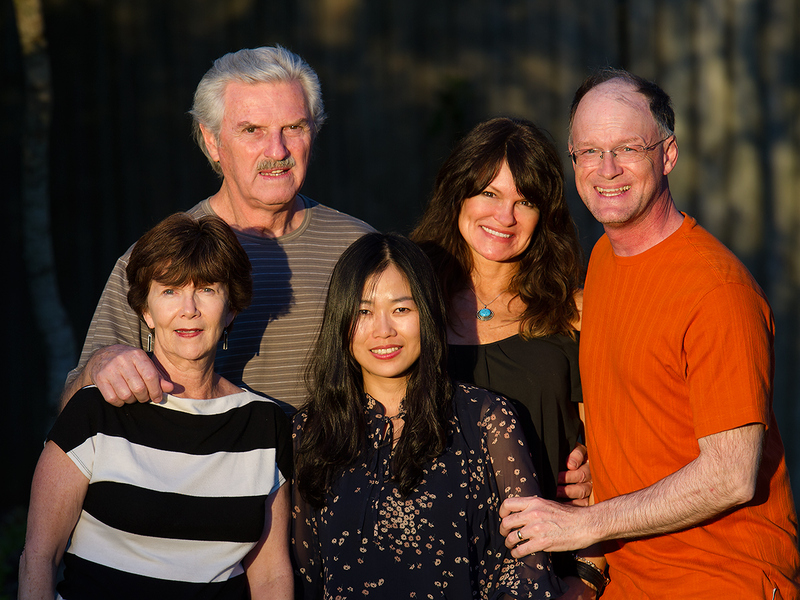 On Tues. 28 Feb. 2017, ​Elaine Du and I returned to Shanghai, having spent most of the previous six weeks in the United States. 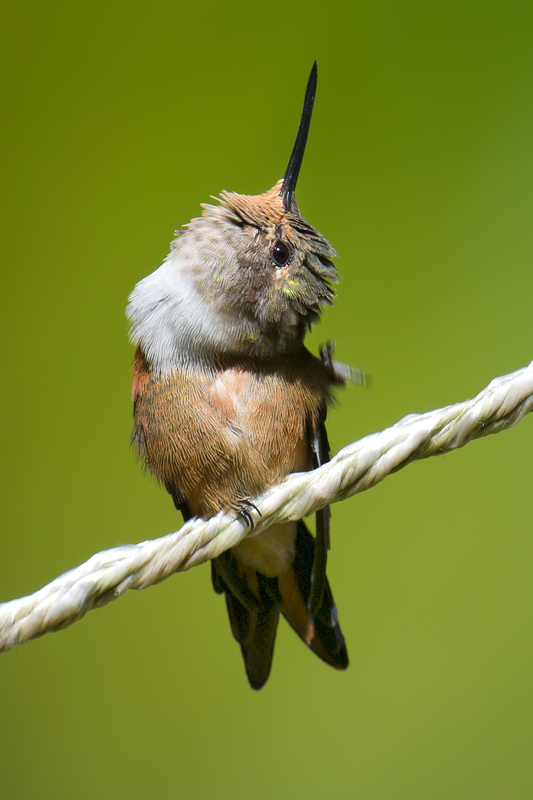 Amid family reunions and other business, my wife and I noted 151 bird species. 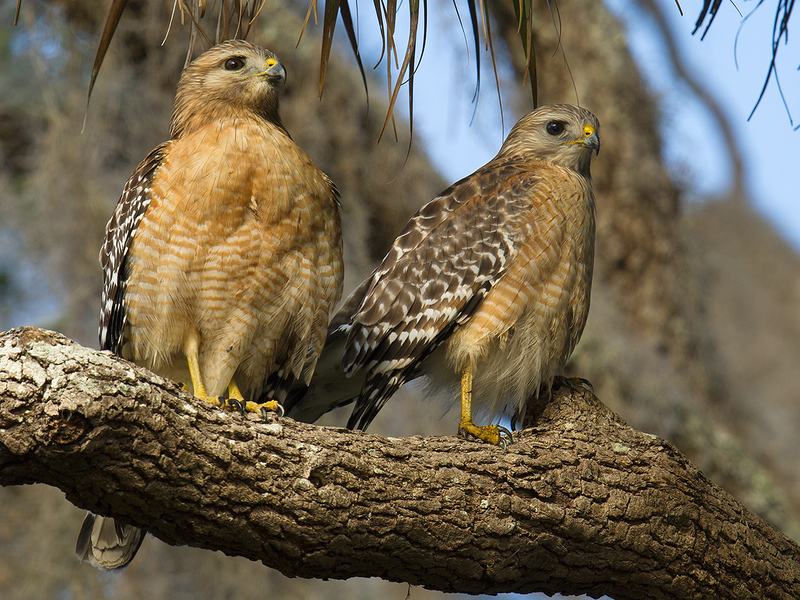 We birded mainly in Volusia County in central Florida. We took a five-day trip to southwest Florida and birded a day in Nassau, capital of The Bahamas. We deepened our understanding of Nearctic avifauna and noted its many similarities to and differences from the birds of China. 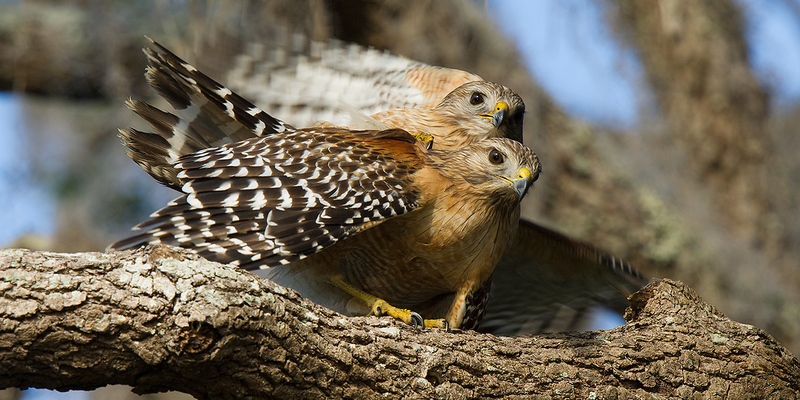 We seamlessly mixed in birding with daily life, something easy to do in Florida. The very subdivision in which my parents live holds endemic Florida Scrub Jay as well as Florida Sandhill Crane Grus canadensis pratensis. Ponds, even those along busy highways, hold Wood Stork Mycteria americana. 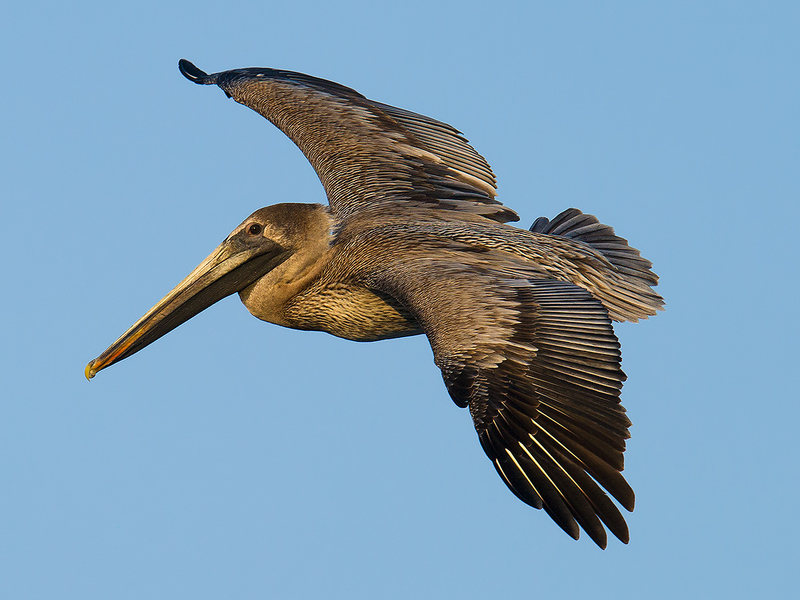 A fixture in coastal towns are Brown Pelican Pelecanus occidentalis and Ring-billed Gull Larus delawarensis. 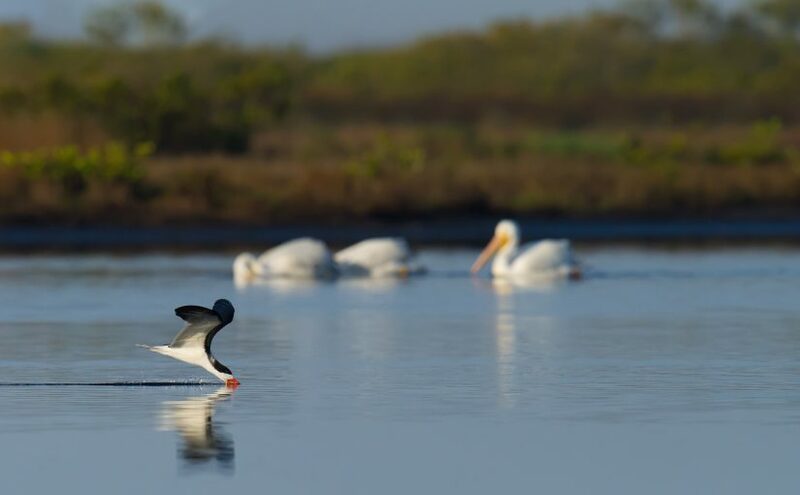 We enjoyed great coastal birding at Merritt Island National Wildlife Refuge on Florida’s Atlantic coast and J. N. “Ding” Darling NWR on the Gulf of Mexico coast. 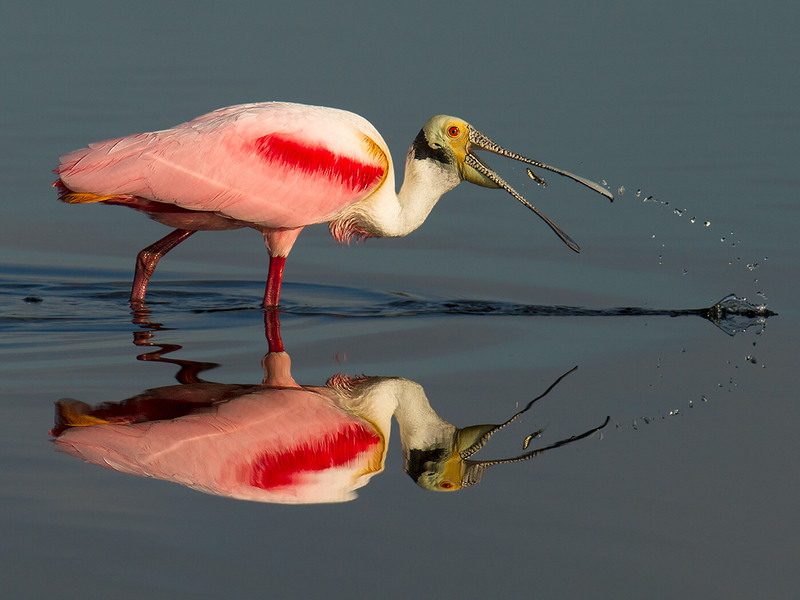 Among the most beautiful birds was Roseate Spoonbill Platalea ajaja, cousin of Shanghai’s Black-faced Spoonbill P. minor. We also found American White Pelican and Yellow-crowned Night Heron. During a cruise to celebrate my parents’ 50th wedding anniversary, Elaine and I had 10 life birds in Nassau. 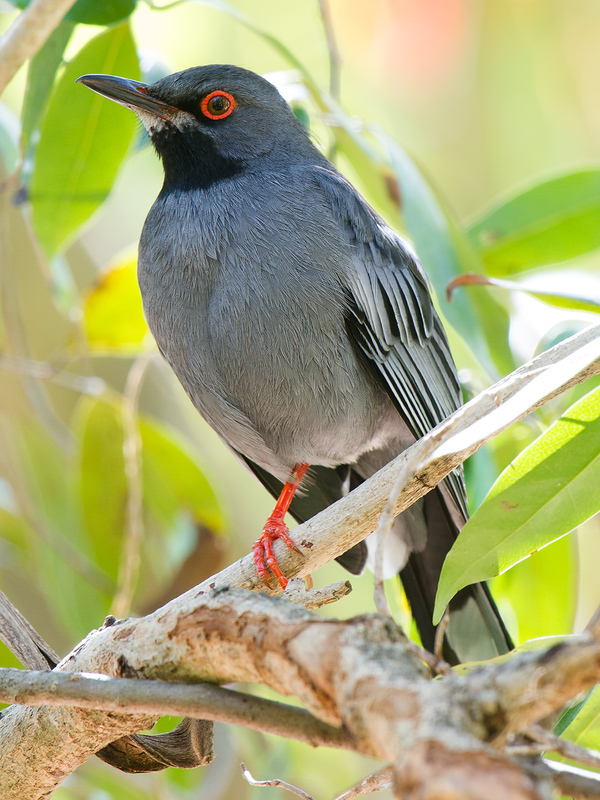 Although close to the North American mainland, The Bahamas holds various taxa rarely noted in Florida, among them Red-legged Thrush Turdus plumbeus and the endemic hummingbird Bahama Woodstar. 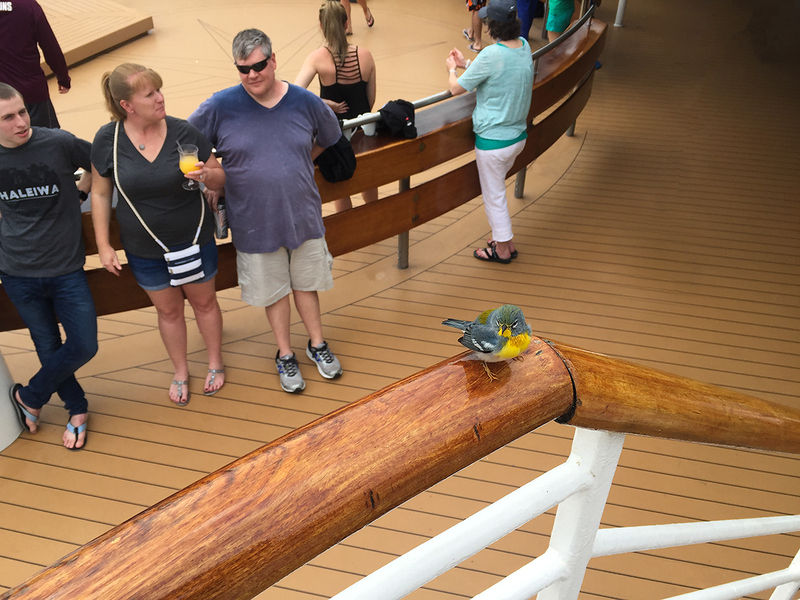 We had visible migration in the form of a Northern Parula that appeared on our cruise ship while the vessel was far out at sea. 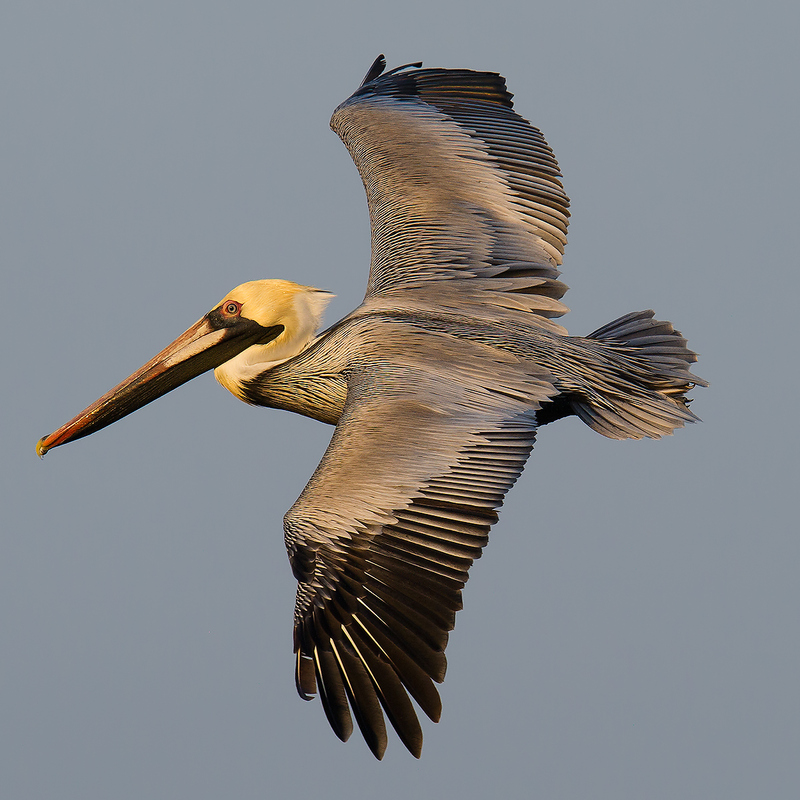 In the United States poaching is rare, and the unwary as well as the secretive birds survive. Elaine and I were able to get close to various species and with little trouble achieve excellent photos. Because the air in Florida is clean, the light is often exquisite, and the photos, especially those taken early and late in the day, really pop. Here is Eastern Meadowlark from Osceola County and Cooper’s Hawk Accipiter cooperii from Sanibel Island. In Nassau I got close to wintering Ovenbird. 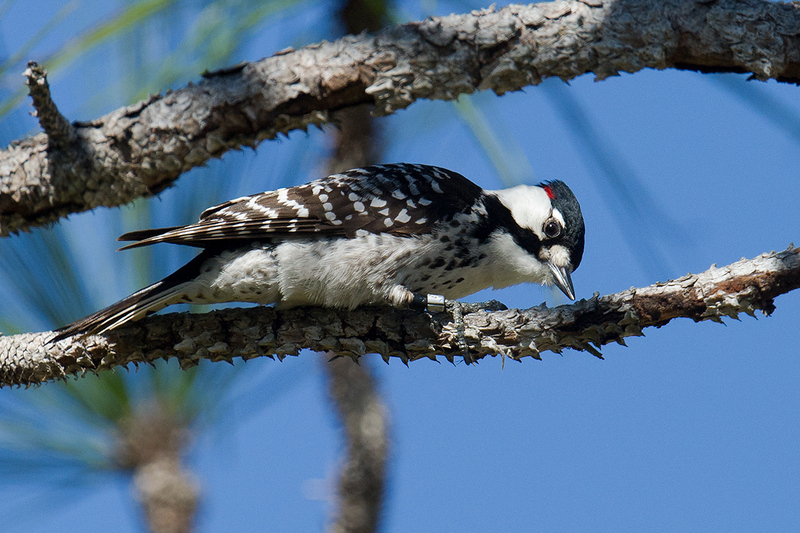 Red-cockaded Woodpecker is one of the few birds endemic to the United States. 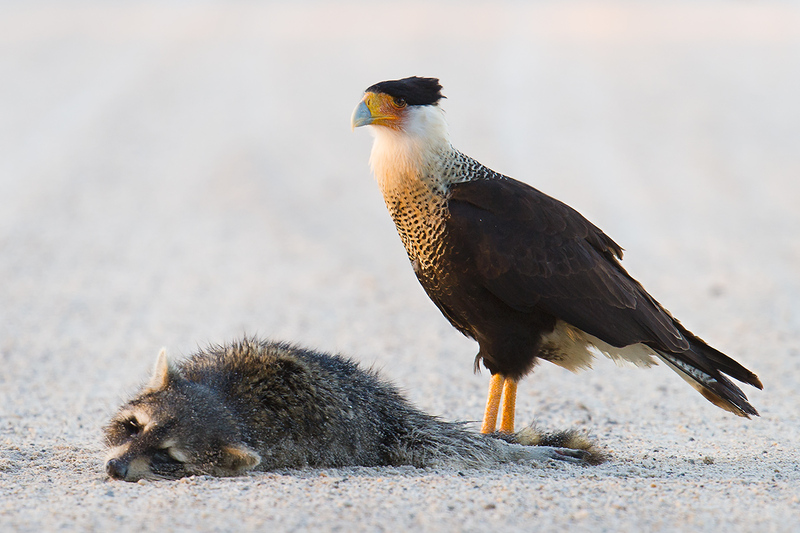 Northern Crested Caracara is a New World member of the falcon family. Its diet includes carrion, and here it was feeding on a dead raccoon. 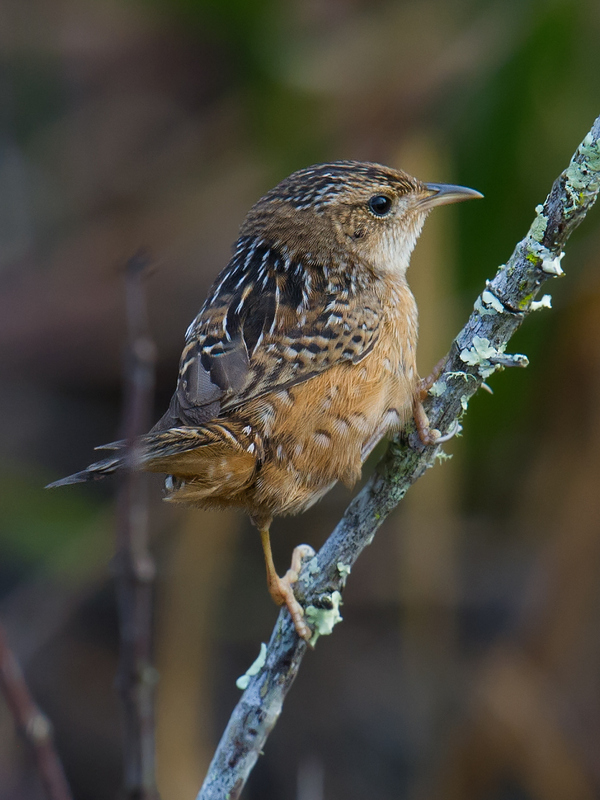 Sedge Wren is a winter visitor to Florida; White-eyed Vireo breeds in the Sunshine State. 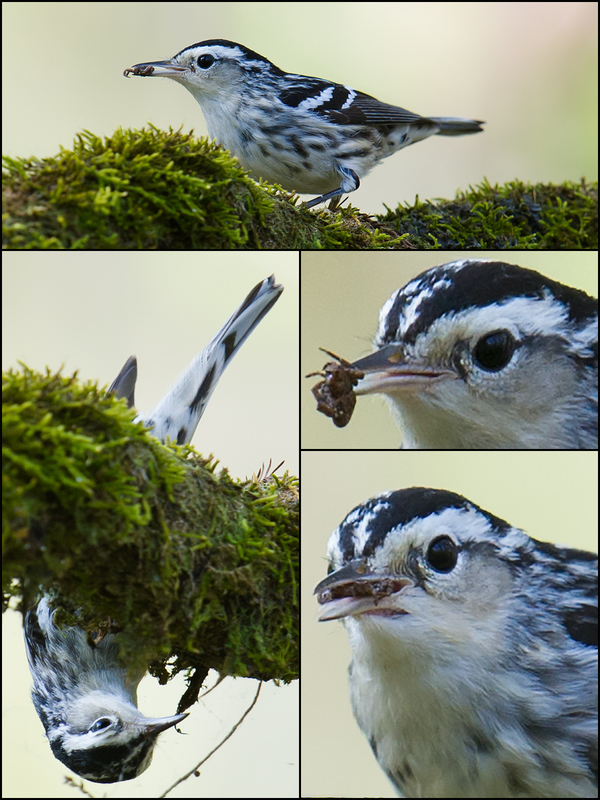 Black-and-white Warbler moves up and down tree trunks like a nuthatch. 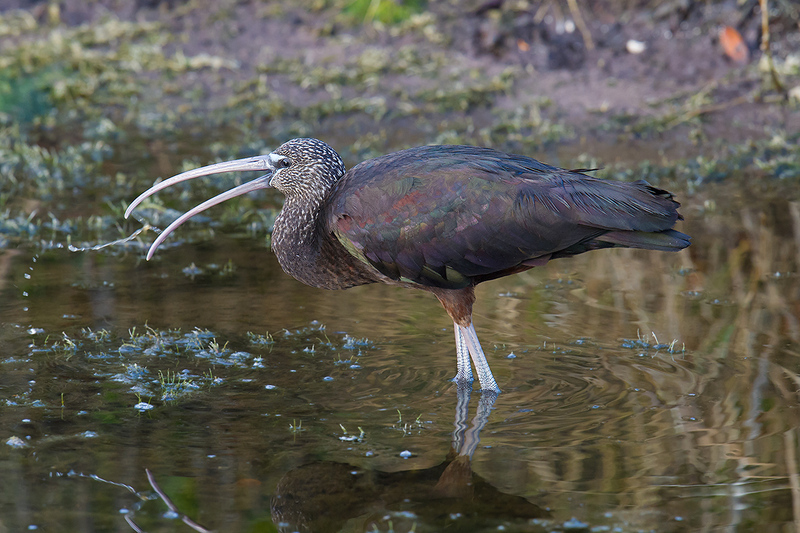 A cosmopolitan species, Glossy Ibis Plegadis falcinellus inhabits the coastal eastern United States and has been recorded in southeast China. 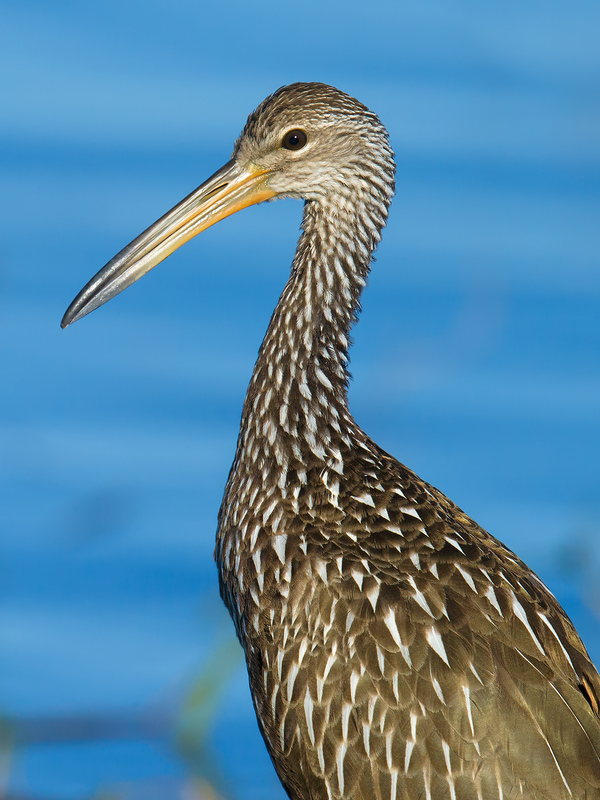 Neither heron nor rail, Limpkin is most closely related to cranes. American Bittern Botaurus lentiginosus and Barred Owl Strix varia represent genera well-known to Shanghai birders. 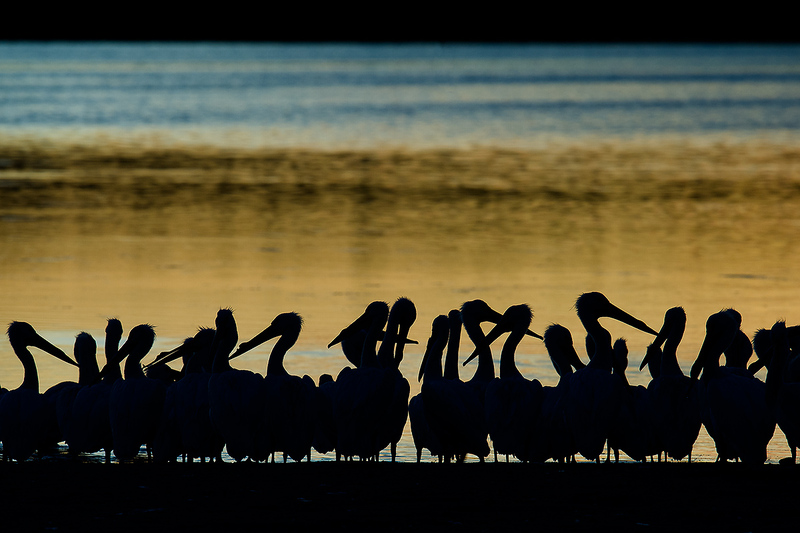 I use a Nikon D3S and Nikkor 600 mm F/4. I mount my lens and camera atop a ​Manfrotto MT055CXPRO3 carbon fiber tripod and ​MVH502AH video head. I use my iPhone 6 for landscape shots. Visit my eBird profile page for access to my day lists from Florida as well as China. 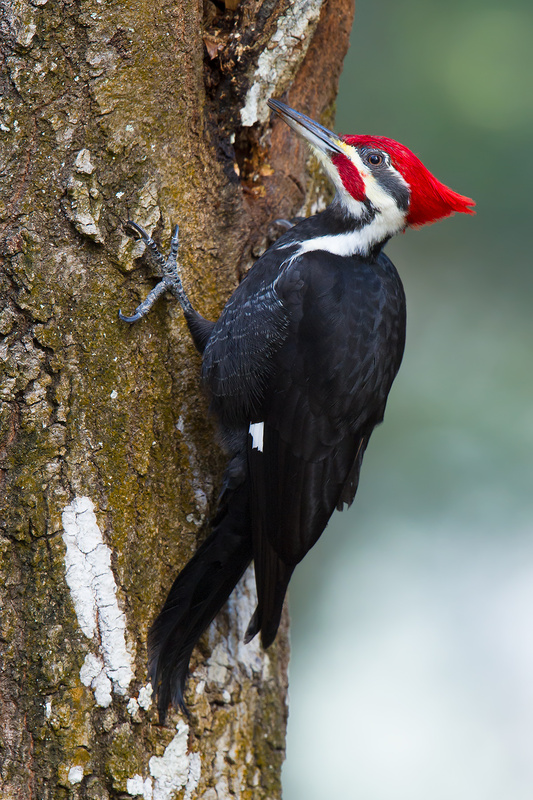 Editor’s note: In the photo above, Pileated Woodpecker Dryocopus pileatus pauses while feeding in a “hammock” or stand of trees. American Robin Turdus migratorius is visible in the background. The photo is from Gemini Springs Park in Volusia County, Florida and was taken on 22 Jan. 2017. 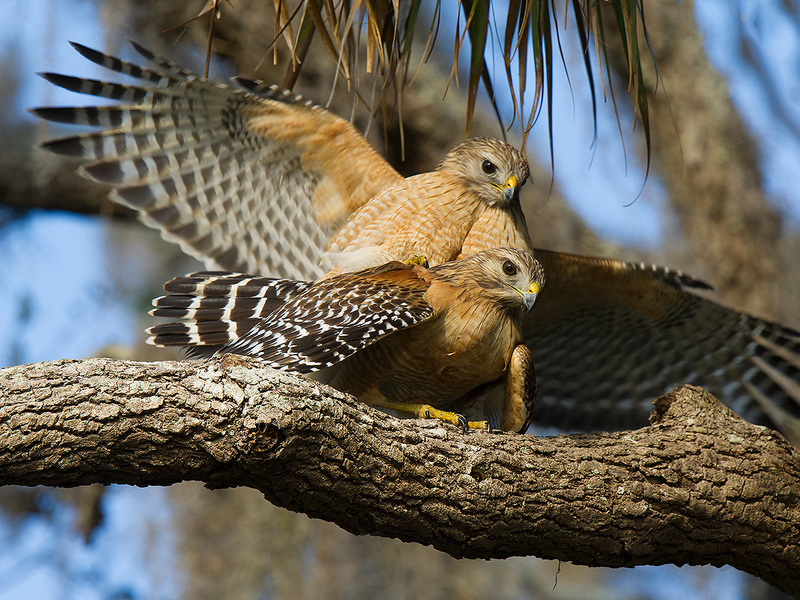 This post is the first in a two-part series about my recent experiences birding in Florida. For Part 2, click here. Greetings from the United States! 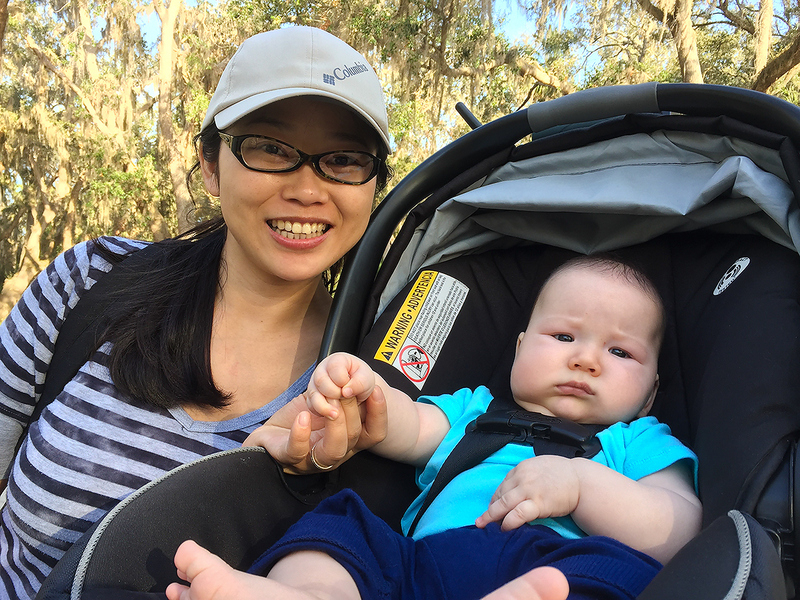 On 19 Jan. Elaine Du and I arrived at my parents’ home in Florida. Birding began immediately, with good records such as Sandhill Crane coming from my parents’ very own front yard. 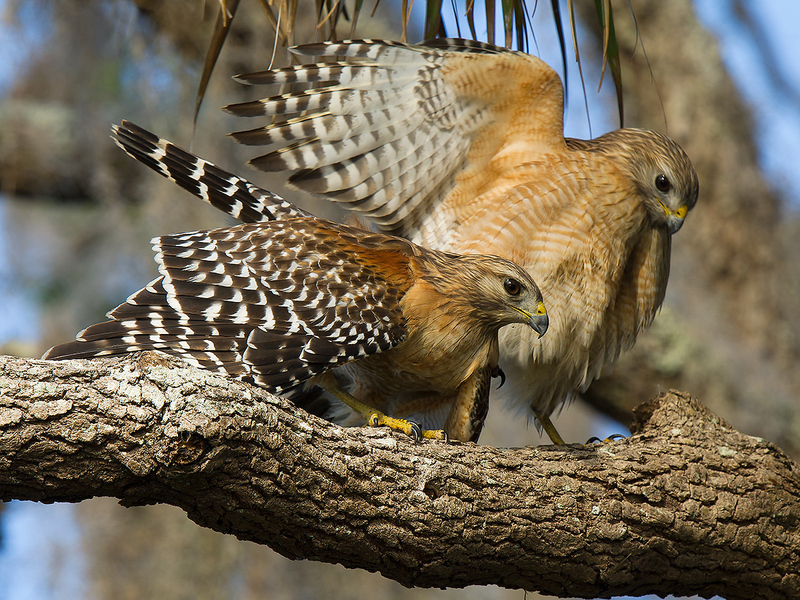 The Sunshine State may be the best state in the USA for birding, and it is particularly good in winter. 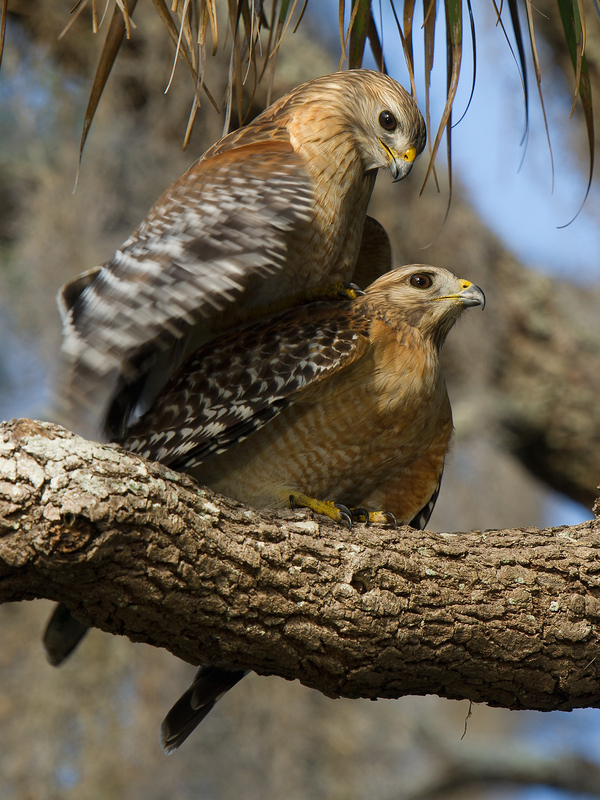 In this post, I will give you an introduction to birding in central Florida. 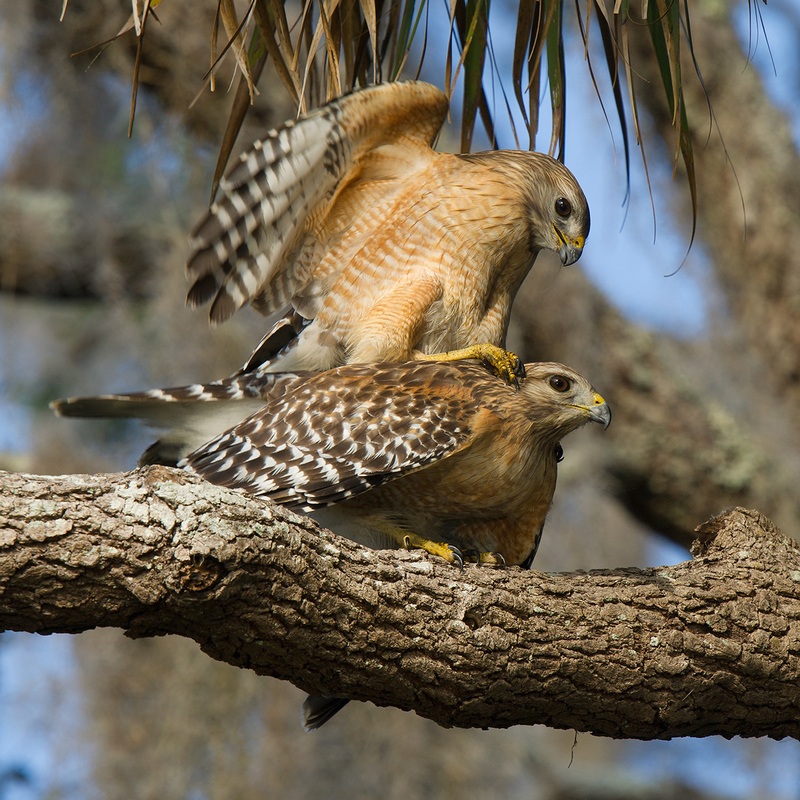 In Debary, as in many other places in the United States, wild birds can be quite tame. 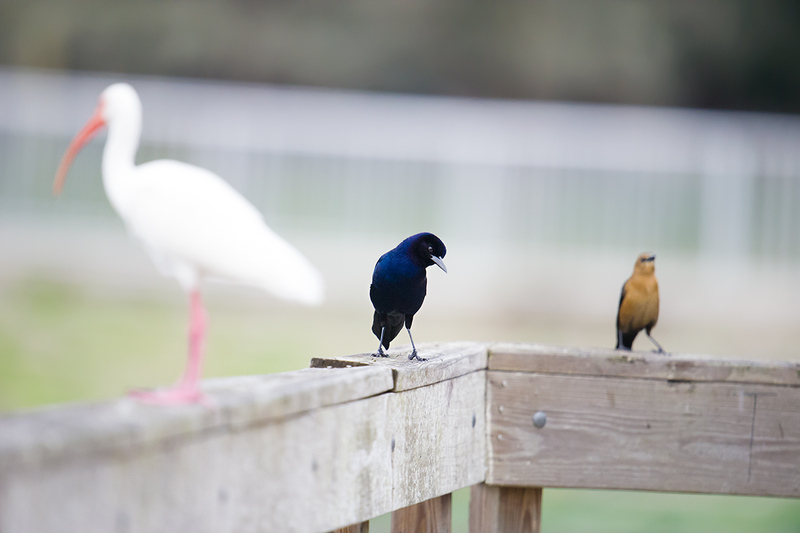 Here at Gemini Springs Park, an American White Ibis (L) and a pair of Boat-tailed Grackle are attracted by the activities of human visitors on the pier. Elaine and I are in Debary, a town in Volusia County, near Orlando, 50 km (30 miles) inland from the Atlantic Ocean. We are at about 29 degrees north latitude at a point 262 km (163 miles) south of the parallel that runs through People’s Square in Shanghai. Because Elaine and I have not seen my parents in two years, much of my time has been spent with family. 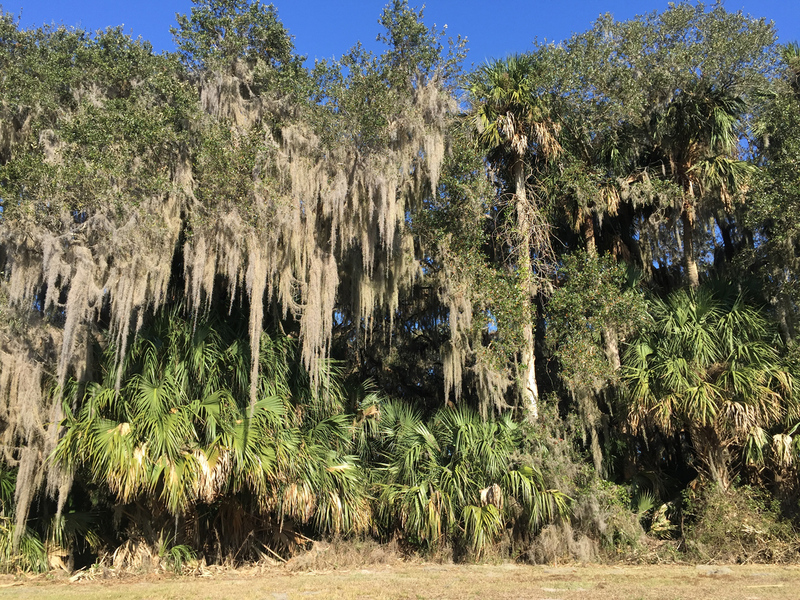 We have visited only two nature reserves, but they are good ones: Gemini Springs Park and Lake Woodruff National Wildlife Refuge. The former is 7 km from my parents’ home; the latter, 31 km. 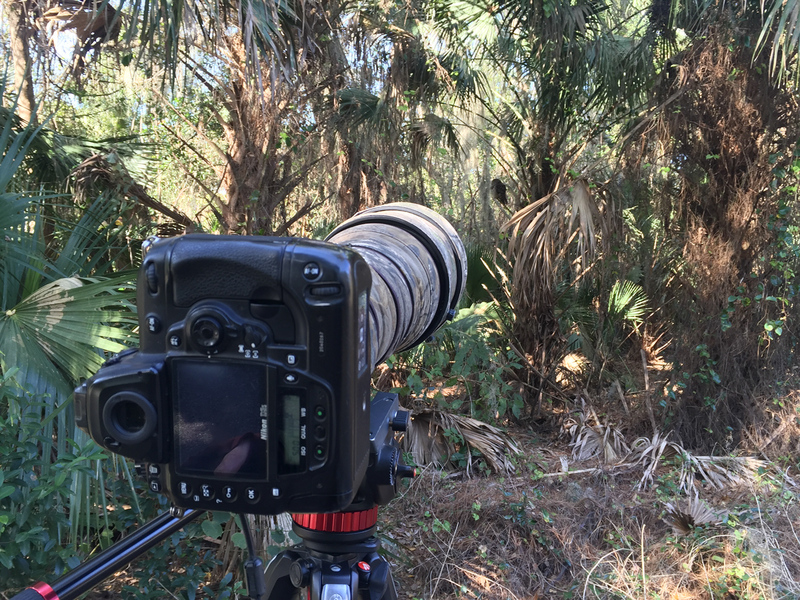 What Can a non-American Birder Learn in Florida? The edge of dense forest in Gemini Springs Park. Spanish Moss Tillandsia usneoides hangs from live oaks. 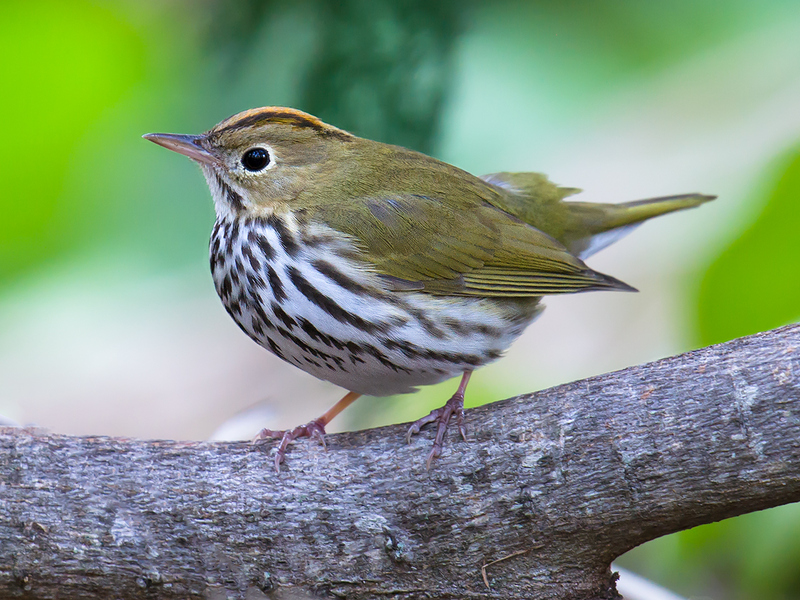 Ovenbird forages on the forest floor, Blue-grey Gnatcatcher and White-eyed Vireo browse in the mid-canopy, and Common Grackle perch atop the high branches. 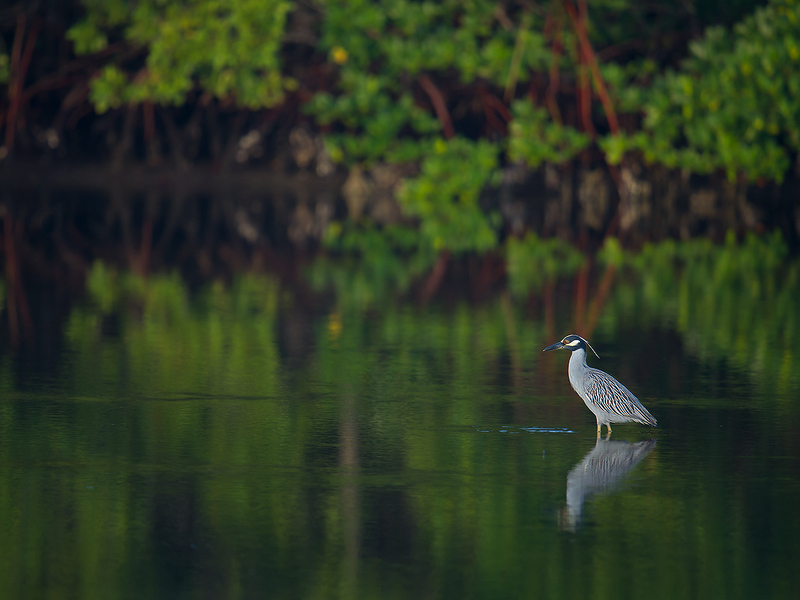 Birders who do most of their birding in China will find many differences in the avifauna of Florida. Entire families, such as the wood warblers (Parulidae), would be new to the first-time birder in the New World. Other families such as Troglodytidae (wrens) and Vireonidae (vireos) would be vaguely familiar. Still other families such as Accipitridae (hawks) and Strigidae (owls) are well-represented in both the Old World and New. 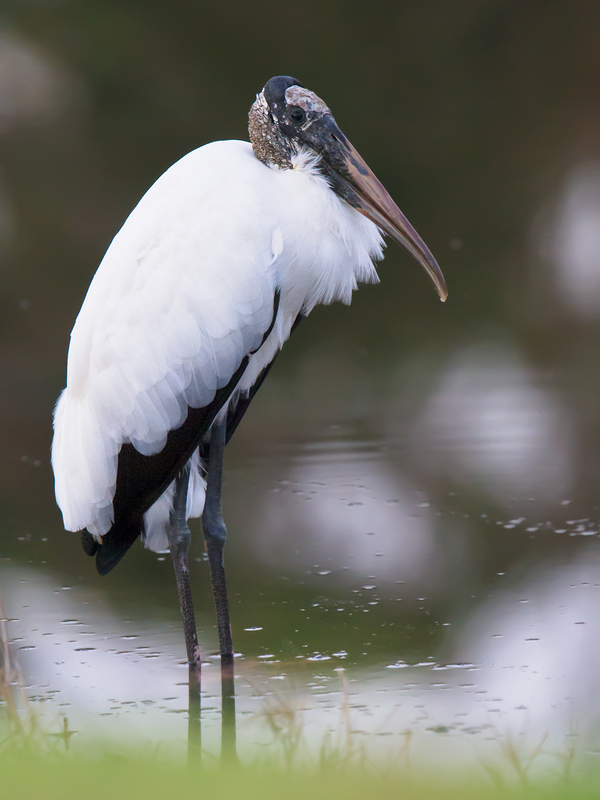 Wood Stork is the only stork that breeds in the United States. I note it regularly around Debary. Wood Stork Mycteria americana at pond at entrance to my parents’ subdivision in Debary, Florida, 24 Jan. 2017. 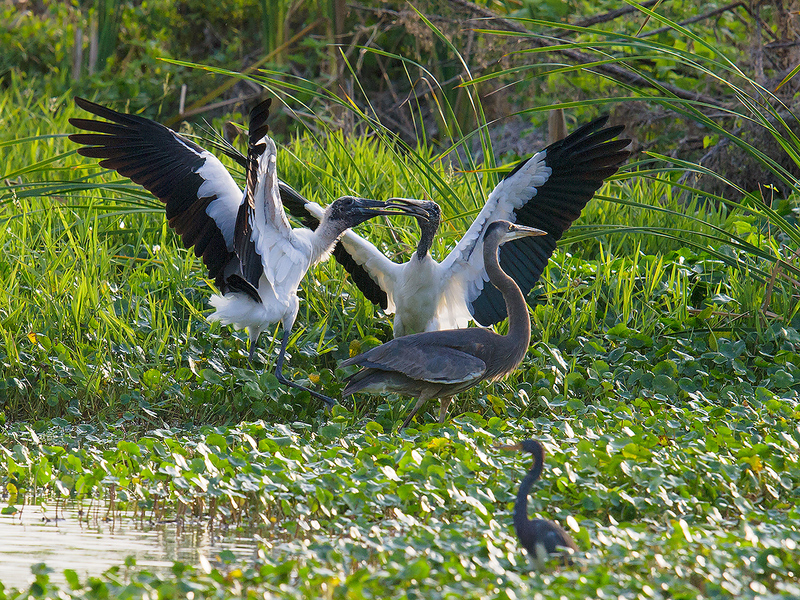 Wood Stork sparring at Gemini Springs Park, 27 Jan. 2017. Next to them is Great Blue Heron Ardea herodias, American analogue to Eurasia’s Grey Heron A. cinerea. In foreground is Tricolored Heron Egretta tricolor. 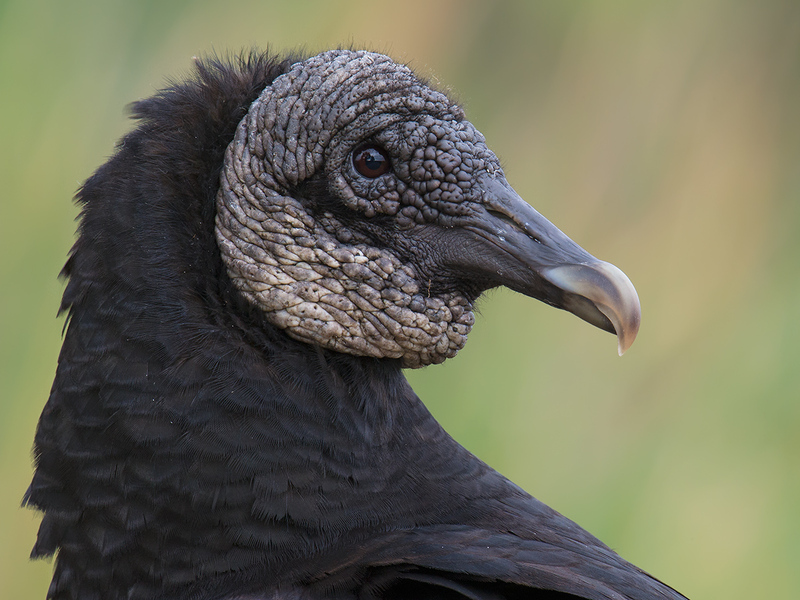 One of the most widespread of New World vultures is Black Vulture Coragyps atratus. 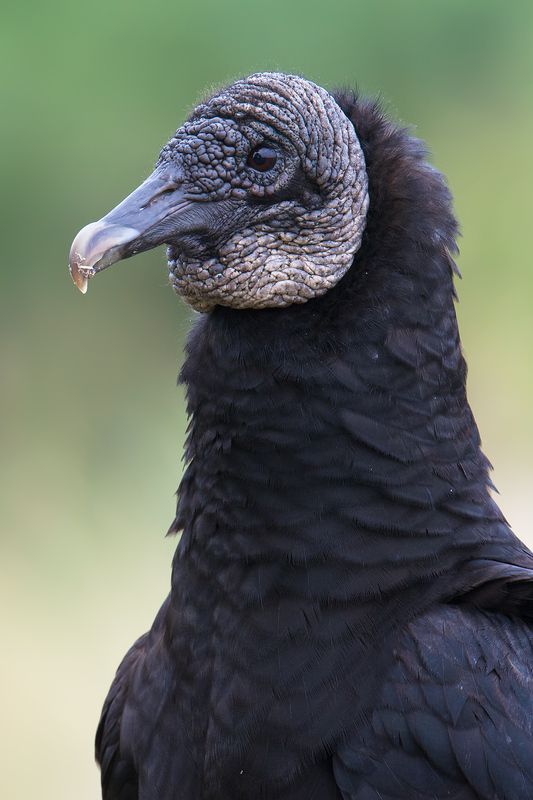 Like Old World vultures, Black Vulture finds carrion by sight, and it lacks feathers on its face, crown, and throat. The birds are very tame and approached me when I lay on the ground for these closeups. Black Vulture (adult), Lake Woodruff National Wildlife Refuge, 26 Jan. 2017. 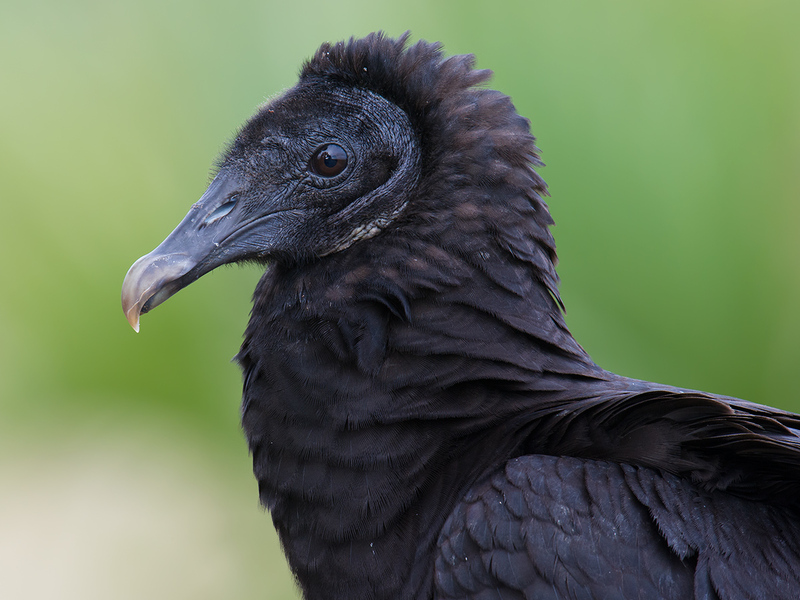 Black Vulture, adult. The bare face is unsightly but helps keep the bird clean. 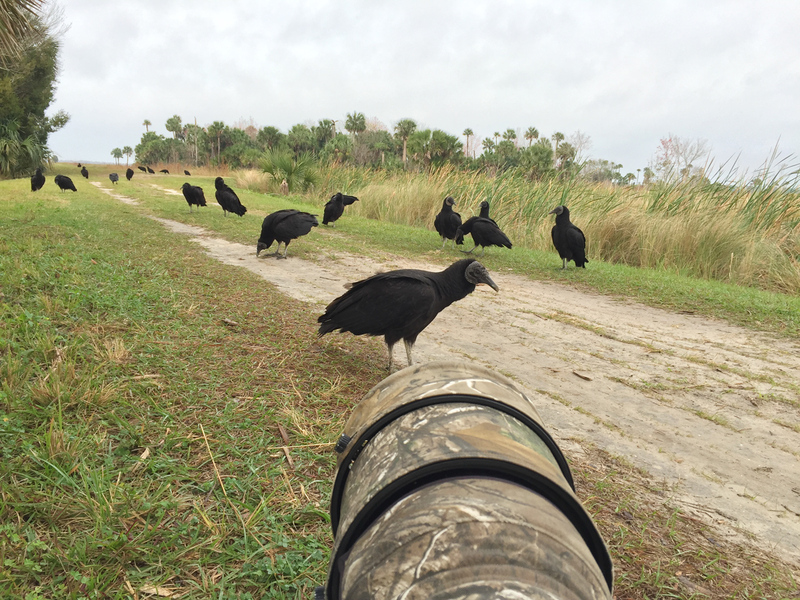 Black Vulture approached my camera as I lay on the ground. 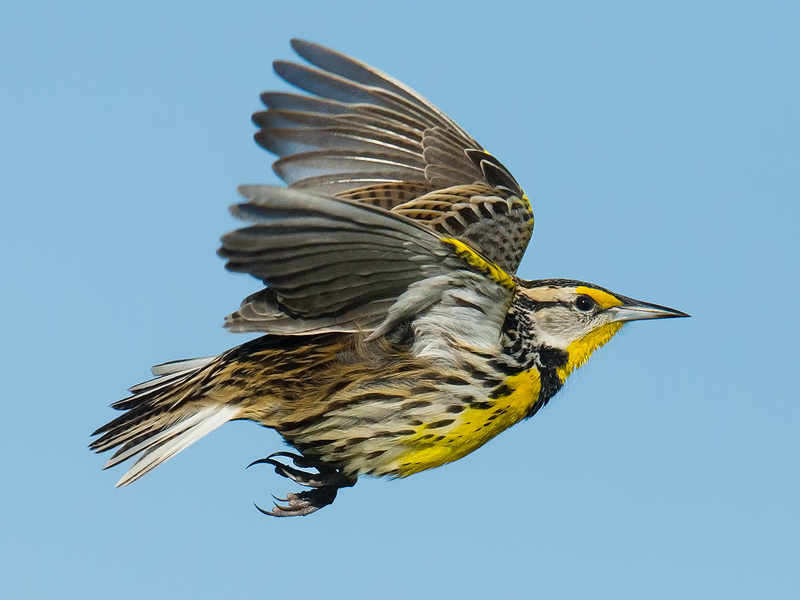 In some cases, China and America share birds not only of the same family or genus, but also of the same species. 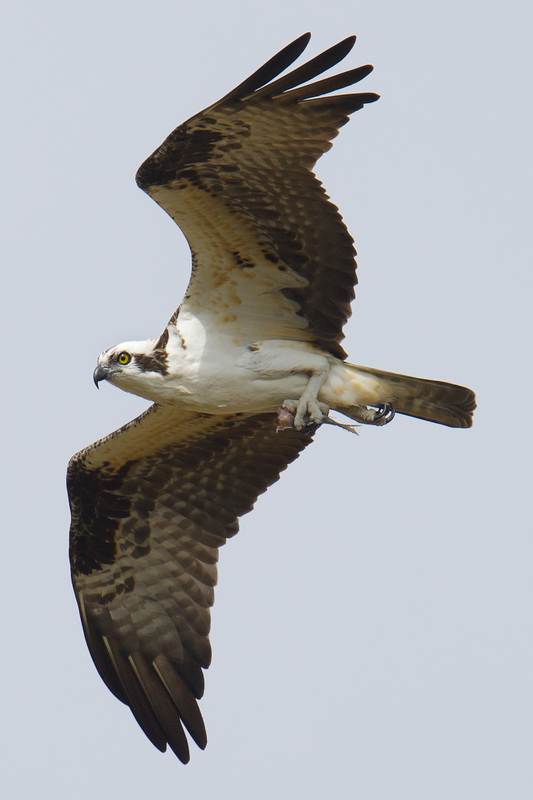 Western Osprey Pandion haliaetus is common in Shanghai as well as in the wetlands of Volusia County. Western Osprey carrying half a fish, Lake Woodruff National Wildlife Refuge, 26 Jan.
A common forest hawk of the eastern United States, Red-shouldered Hawk Buteo lineatus is in the same genus as Shanghai’s Eastern Buzzard B. japonicus. 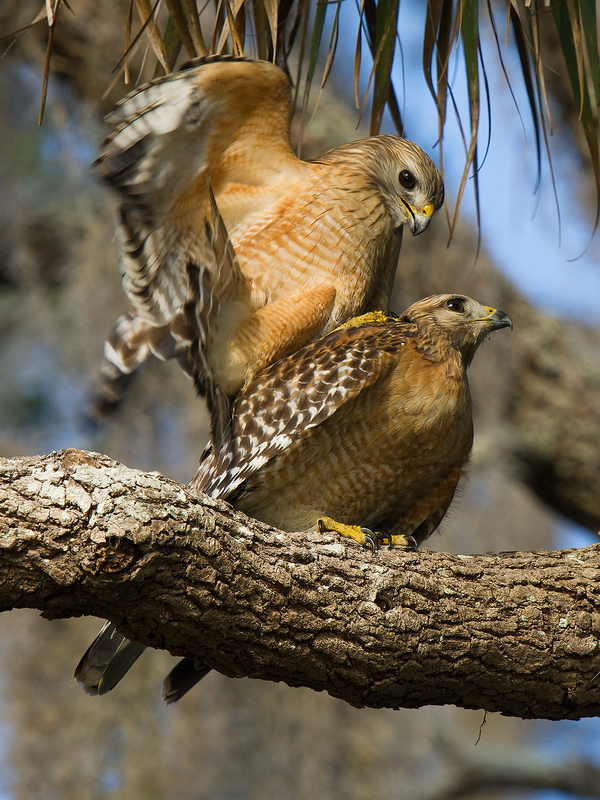 On 27 Jan. at Gemini Springs Park, I photographed a pair mating. America’s Northern Harrier Circus hudsonius is immediately familiar to China-based birders. It is similar to, and was once considered conspecific with, Hen Harrier C. cyaneus. Northern Harrier, Lake Woodruff, 26 Jan.
Shanghai has Brown-cheeked Rail Rallus indicus; Florida offers King Rail R. elegans. I found a pair at Lake Woodruff National Wildlife Refuge. All rails are hard, and a good view such as this one is an experience to be treasured. 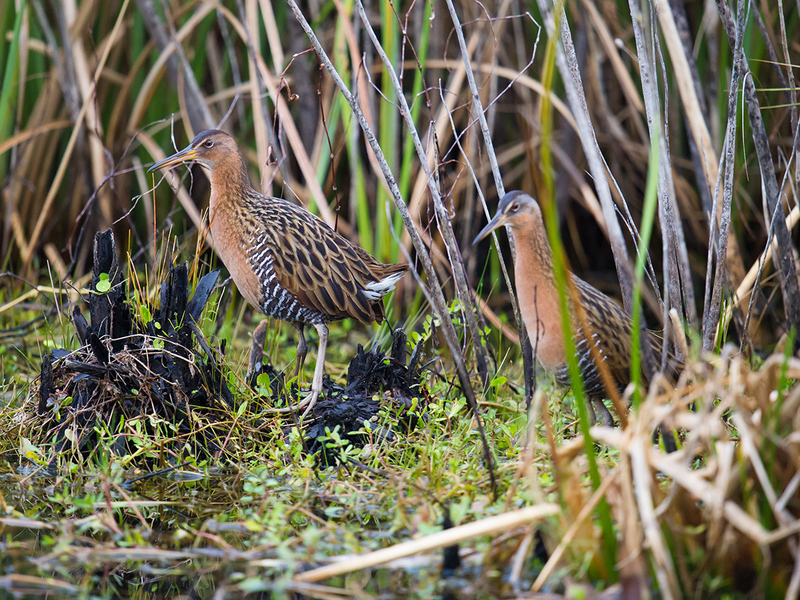 King Rail Rallus elegans, Lake Woodruff National Wildlife Refuge, 26 Jan.
Volusia County is home to Florida Sandhill Crane Grus canadensis pratensis. The cranes are a non-migratory population, and as suburbia has grown up around them, the cranes have not only adapted, but flourished. 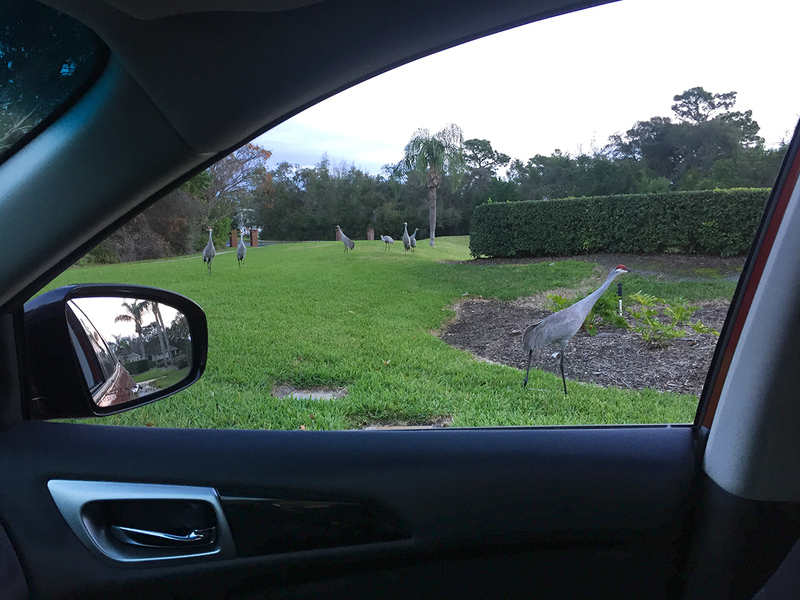 Here is a group outside my parents’ home in Debary, photographed through the window of my car. Sandhill Crane, Debary, 27 Jan. 2017. Limpkin Aramus guarauna is the sole member of Aramidae. It looks like a large rail or heron but is most closely related to cranes. The species ranges from Florida to Argentina. 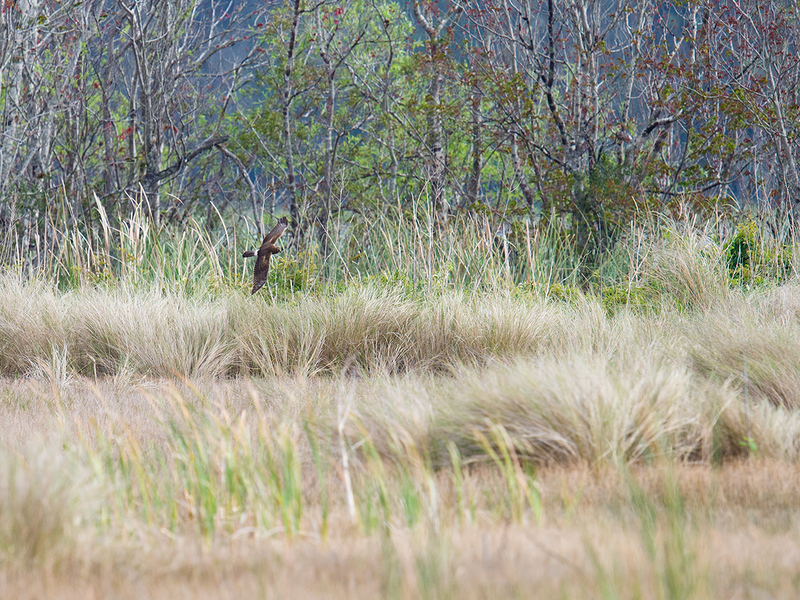 At Gemini Springs I found a Limpkin feeding with American White Ibis Eudocimus albus. 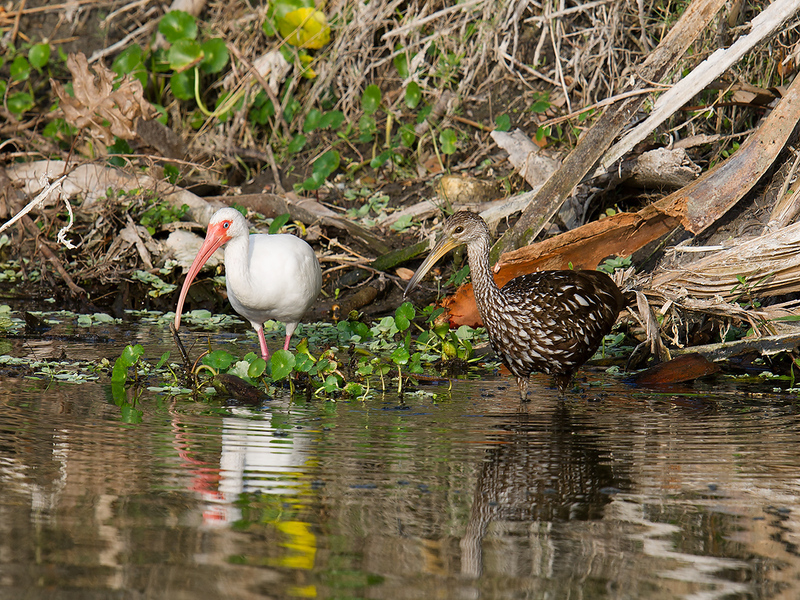 Limpkin (R) with American White Ibis, Gemini Springs Park, 27 Jan. 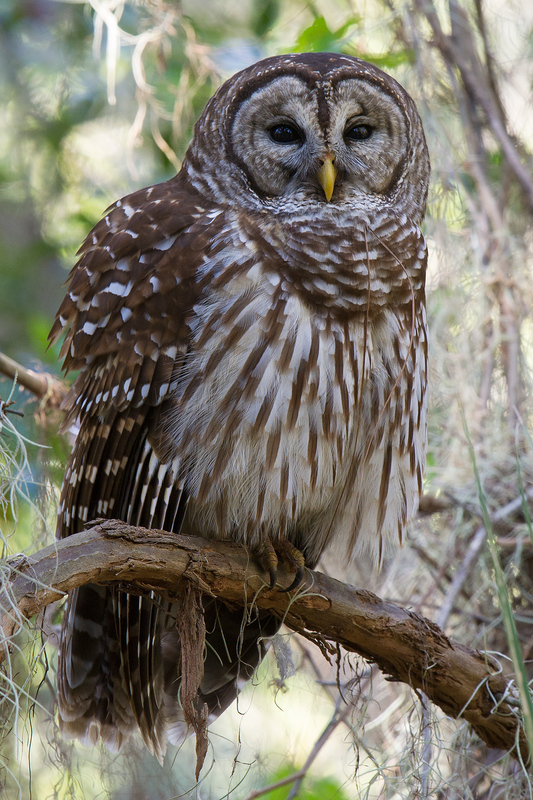 Barred Owl Strix varia is an owl of dense forests. It is common, and its hoot is well-known. Strix is a large genus and includes China’s Himalayan Owl S. nivicolum. Pair at Lake Woodruff National Wildlife Refuge, 26 Jan. 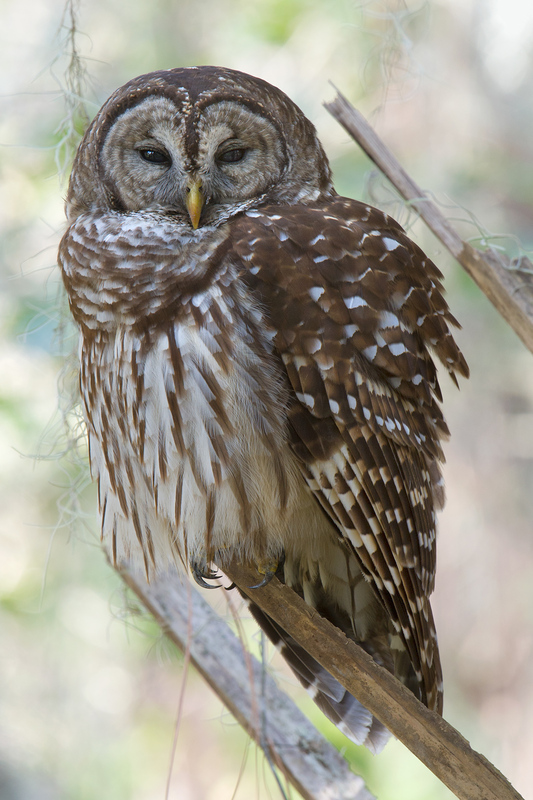 Sleepy Barred Owl at Gemini Springs, 28 Jan. 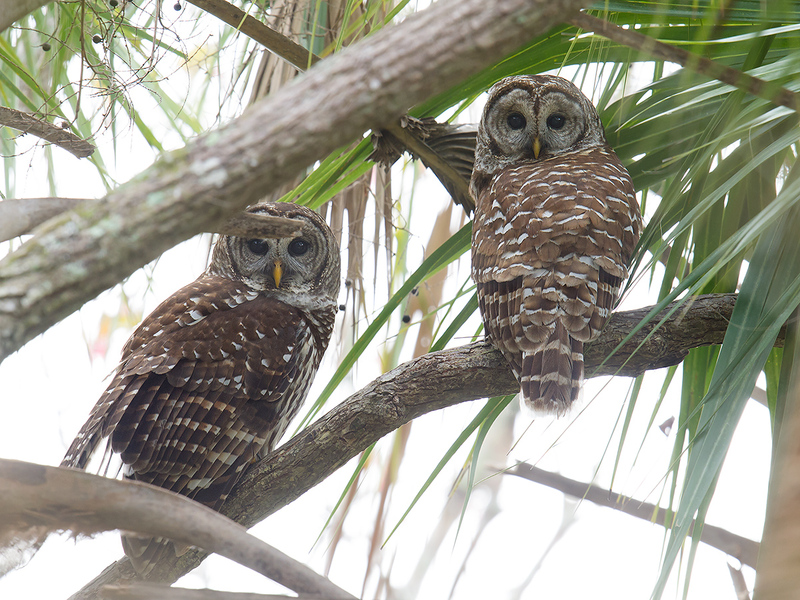 The sleepy Barred Owl was perching on a palm tree near a well-traveled bicycle path. Pileated Woodpecker Dryocopus pileatus is part of a genus of large, powerful woodpeckers that includes Eurasia’s Black Woodpecker D. martius. 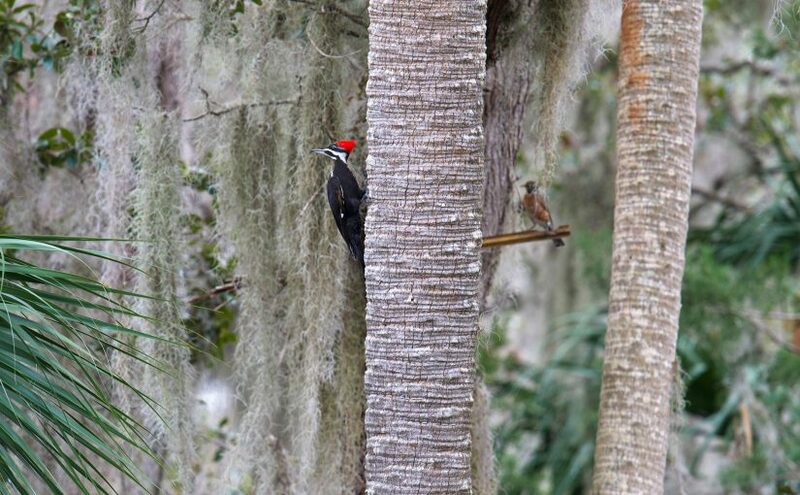 Pileated Woodpecker flourishes in dense forests with large trees, of which there are many in central Florida. Pileated Woodpecker, Lake Woodruff National Wildlife Refuge, 25 Jan. 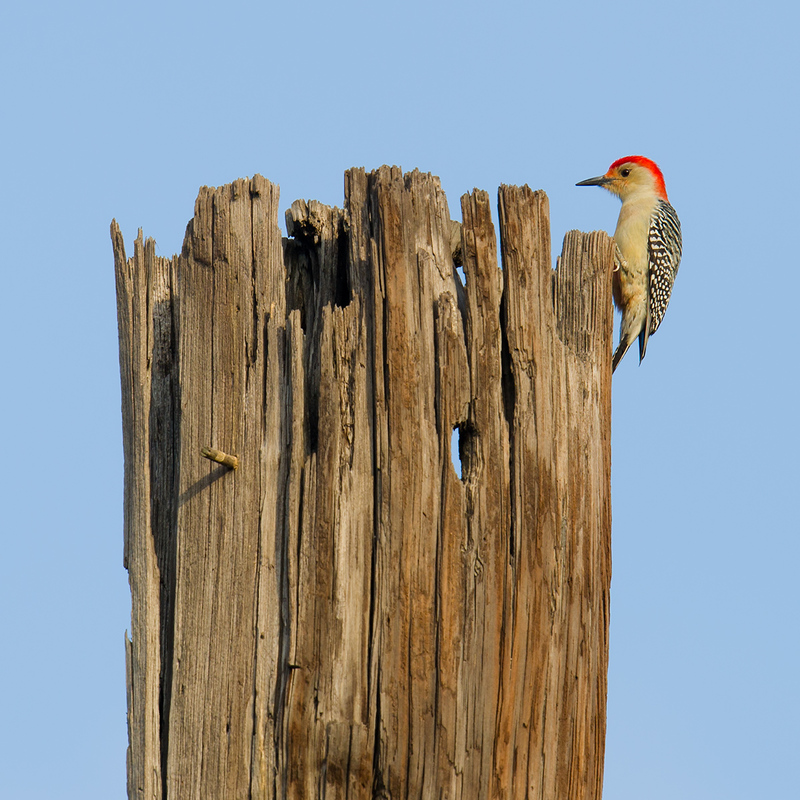 This is Red-bellied Woodpecker Melanerpes carolinus. Melanerpes contains 24 species, all in the Americas. Vireonidae is a group of small to mid-sized passerines. Most live in the New World. 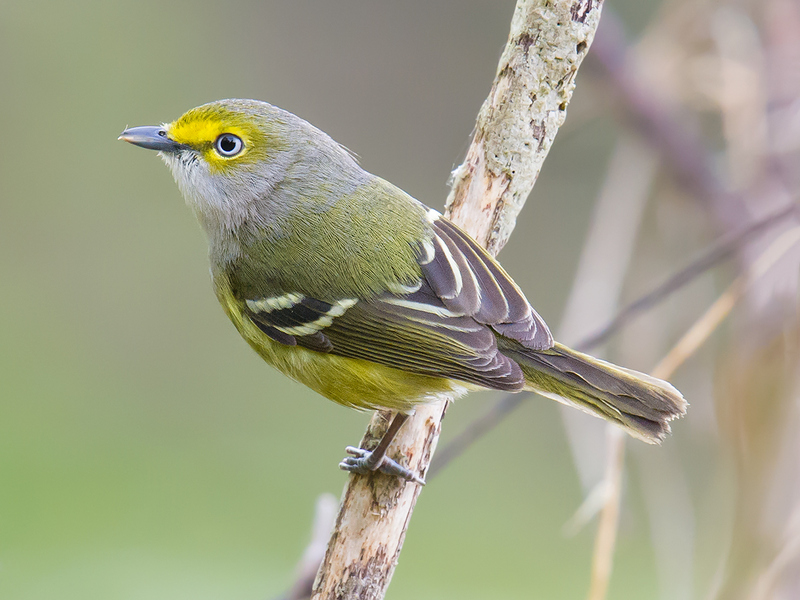 White-bellied Erpornis and the shrike-babblers occur in China. 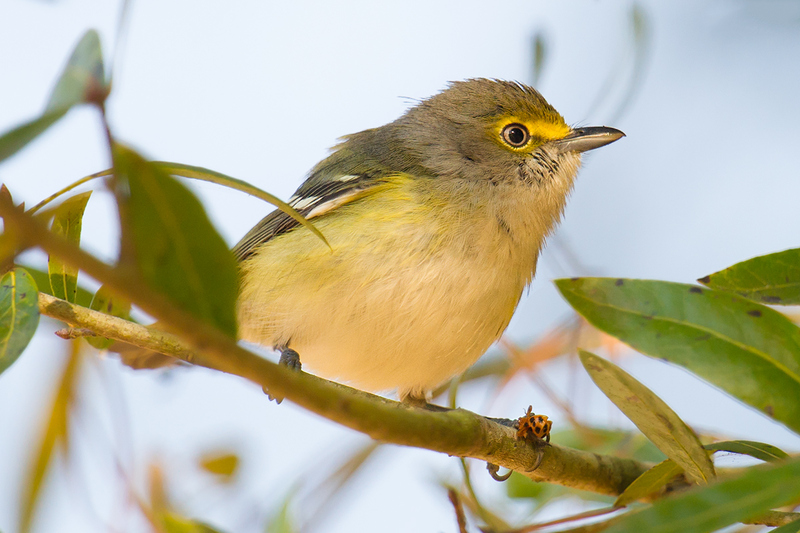 In recent days in Florida I have found White-eyed Vireo Vireo griseus and Blue-headed Vireo V. solitarius. White-eyed Vireo with ladybug, Gemini, 24 Jan.
All six members of Regulidae are in a single genus, Regulus. Goldcrest Regulus regulus can be found in winter and on migration in Shanghai. North America has the very similar Ruby-crowned Kinglet R. calendula. 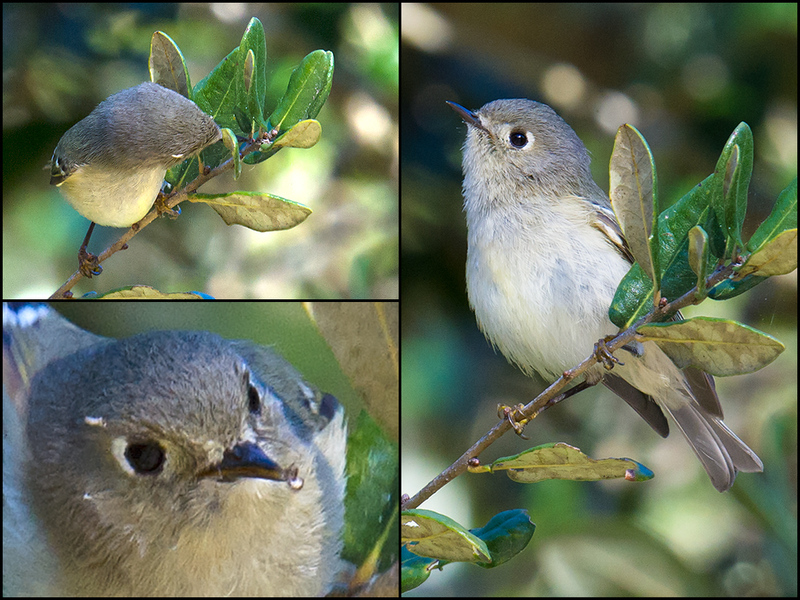 Ruby-crowned Kinglet searches for tiny arthropods very much in the manner of its Eurasian cousin Goldcrest. Females, such as this one photographed 24 Jan. at Gemini, lack the ruby crown. The sole Old World representative of Troglodytidae is Eurasian Wren Troglodytes troglodytes. 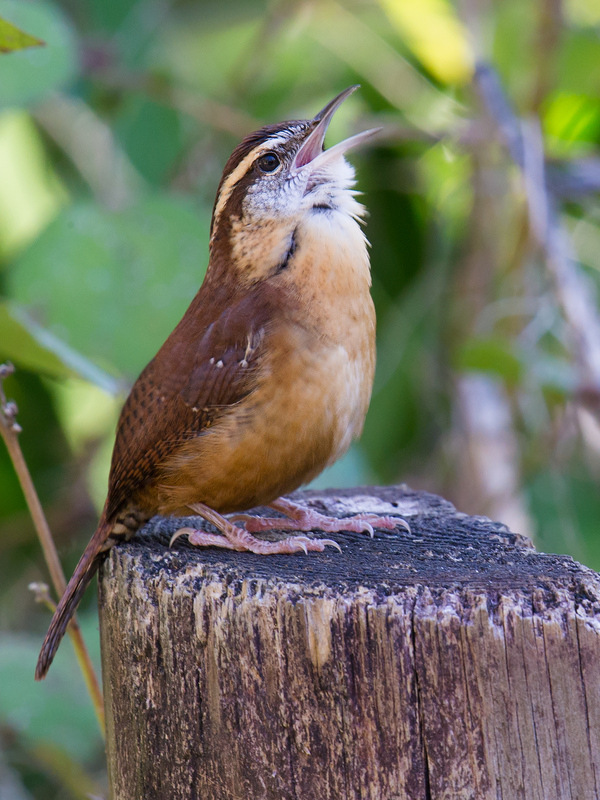 In Florida I have had House Wren T. aedon, Marsh Wren Cistothorus palustris, and the accomplished songster Carolina Wren Thryothorus ludovicianus. Carolina Wren, Gemini, 24 Jan. 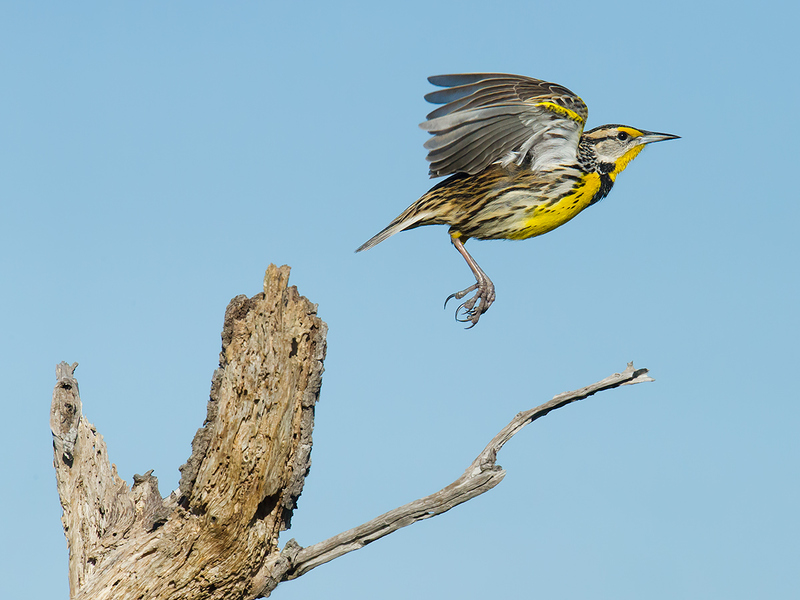 The New World warblers are an important passerine family confined to the New World. Most species are arboreal and insectivorous and fill niches similar to those filled in the Old World by leaf warblers. 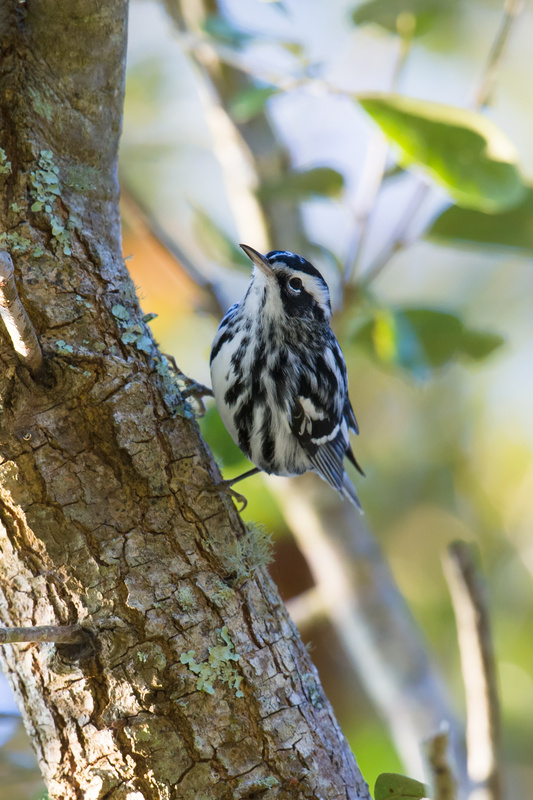 Black-and-white Warbler Mniotilta varia is the sole member of its genus. It is the only New World warbler to move up and down tree trunks in the manner of a nuthatch. Black-and-white Warbler, Gemini, 28 Jan.
Icterids are a strictly New World family. 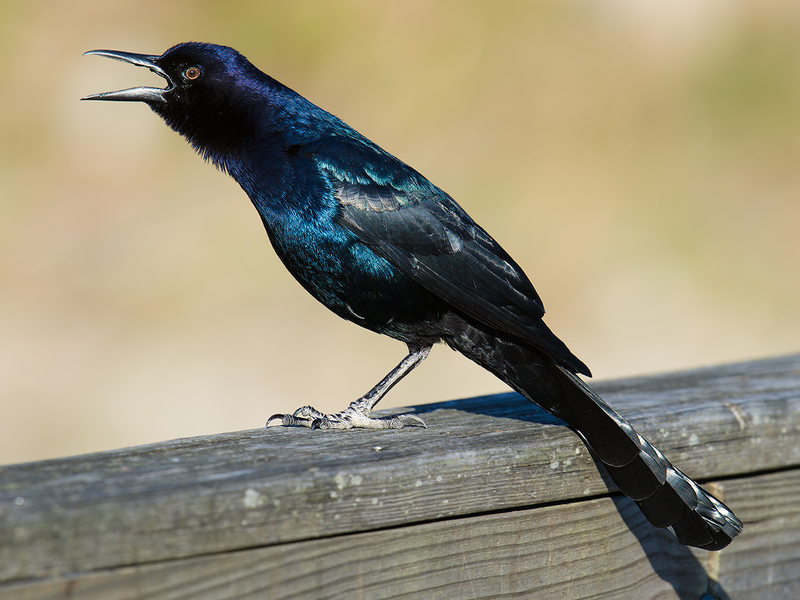 Boat-tailed Grackle Quiscalus major lives along the U.S. coast from New York to Texas. In Florida it also occurs inland. Boat-tailed Grackle, Gemini, 28 Jan.
American “sparrows” are more closely related to Old World buntings. Both groups are in Emberizidae. 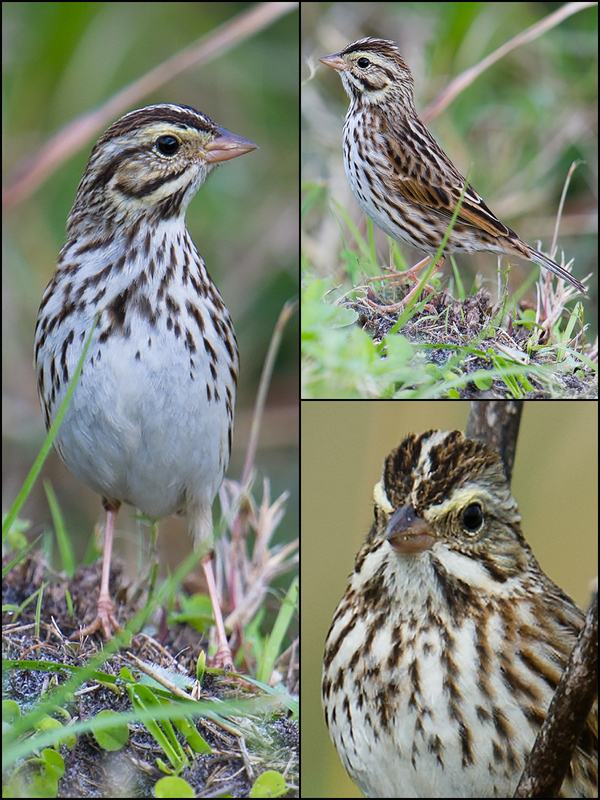 Savannah Sparrow Passerculus sandwichensis is a bird of open country. 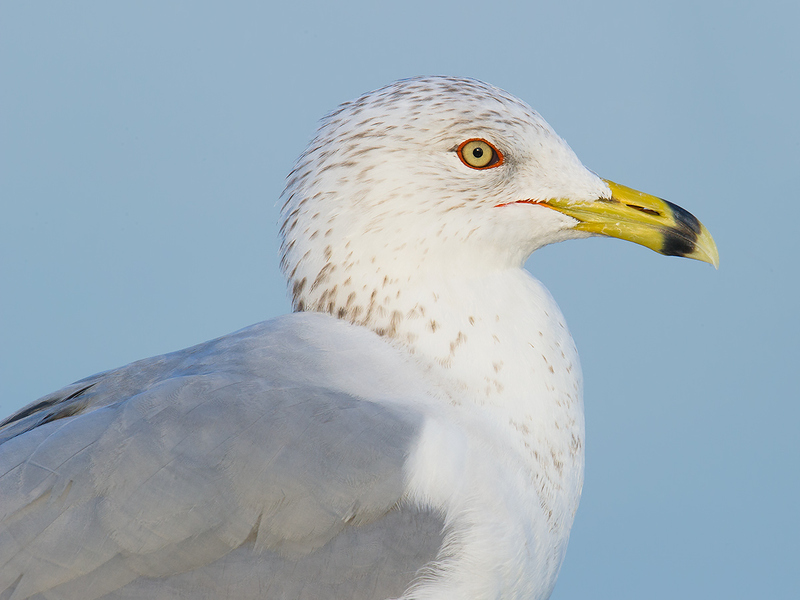 It breeds from Alaska through Canada and the northern Lower 48 states and is a winter visitor to Florida. 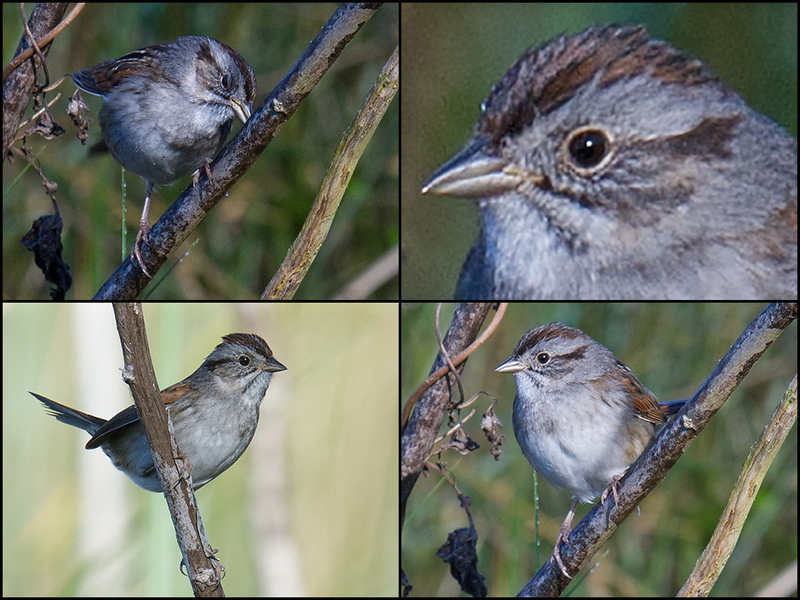 Swamp Sparrow Melospiza georgiana is most at home in wetland habitats. It too is a winter visitor to Florida. It breeds in the northern U.S. and Canada. Savannah Sparrow, 26 Jan. 2017, Lake Woodruff National Wildlife Refuge. Swamp Sparrow, 25 Jan. 2017, Lake Woodruff National Wildlife Refuge. Cardinalidae is a family of finch-like seed-eating birds endemic to the New World. 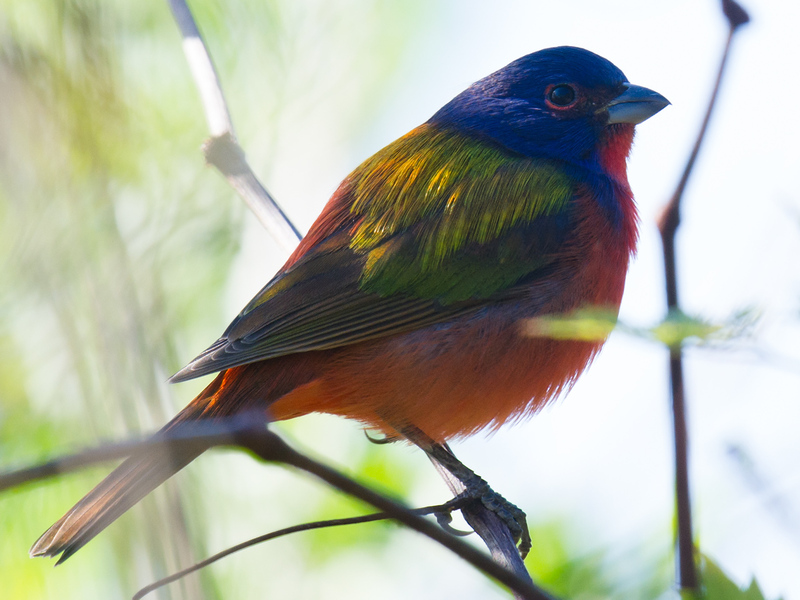 Painted Bunting Passerina ciris is often described as the most beautiful bird in North America. Painted Bunting, Gemini Springs Park, 28 Jan. 2017. I use a Nikon D3S that I purchased in October 2010. The camera has been a steady performer, and I have seen no need to replace it. My lens is the Nikkor 600 mm F/4. I mount my lens and camera atop a ​Manfrotto MT055CXPRO3 carbon fiber tripod and ​MVH502AH video head. I use my iPhone 6 for landscape shots. Visit my eBird profile page for access to my day lists from Florida as well as China. 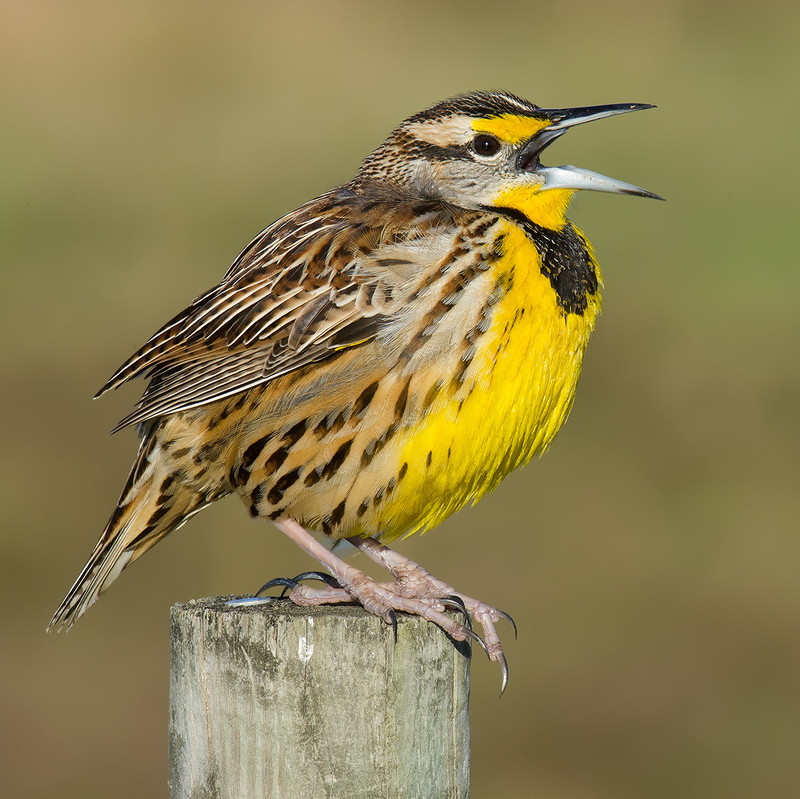 You will need an eBird account to view the profile. 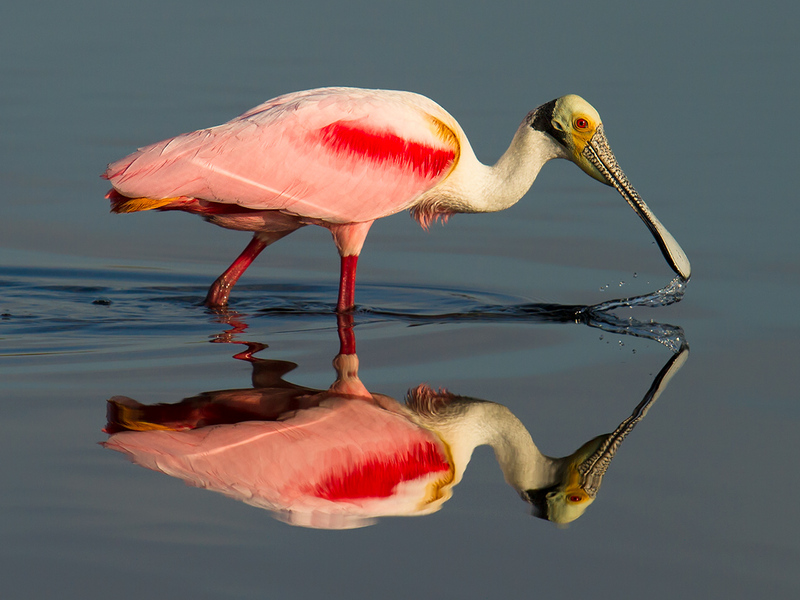 Posted on January 30, 2017 April 13, 2019 Author Craig BrelsfordTags Elaine Du, Florida birding, Lake Woodruff National Wildlife RefugeLeave a comment on Hello from Florida!